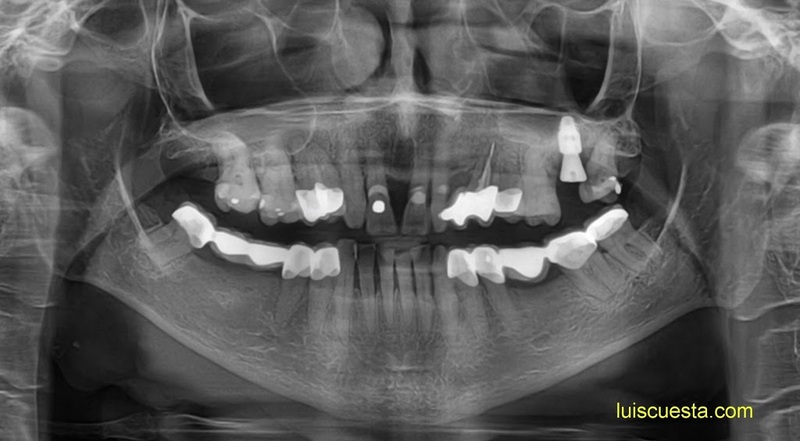 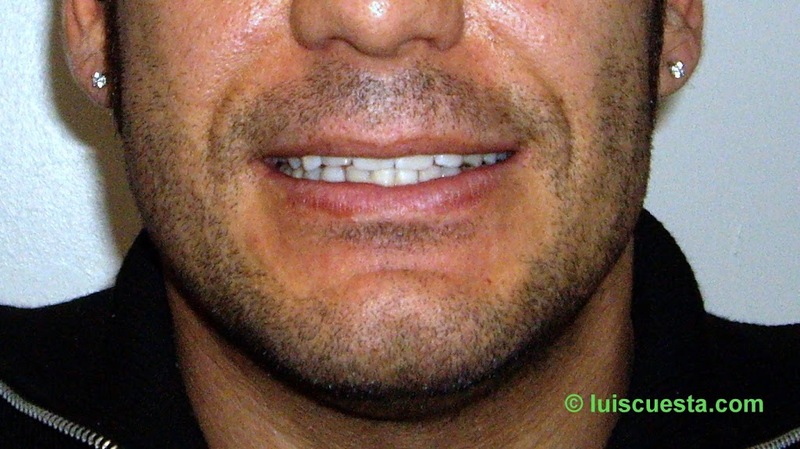 Implants with ball retainers an Locator attachments on the lower jaw are an efficient solution to avoid the instability of a total prosthesis, especially for those patients with a big tongue (macroglosia) and little bone ridge retention. 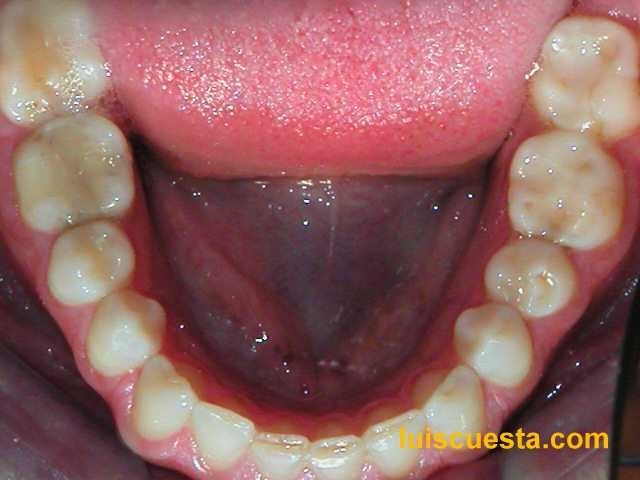 Actually, the tongue tends to grow as we grow old, and even more when we lose teeth, because the leave more place for the tongue itself. 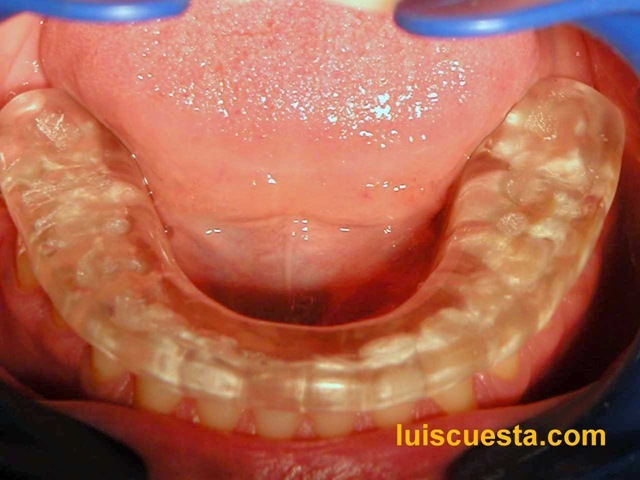 With the tongue movements, the prosthesis comes loose easily and that is usually uncomfortable for the patients because of the lack of confidence on the prosthesis while eating or speaking. 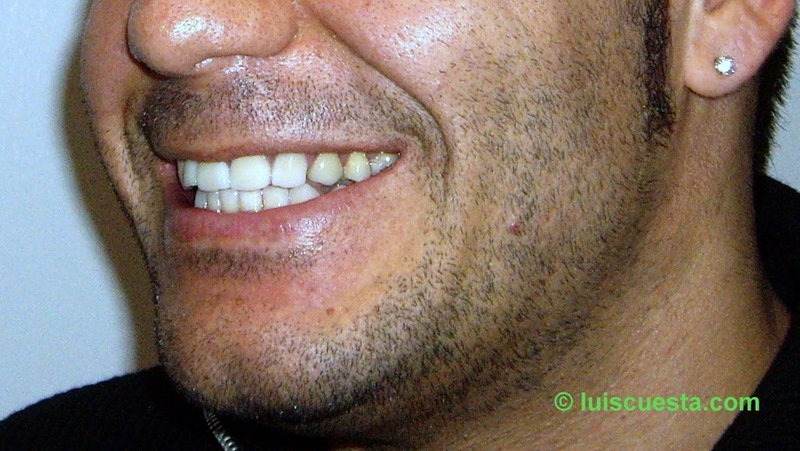 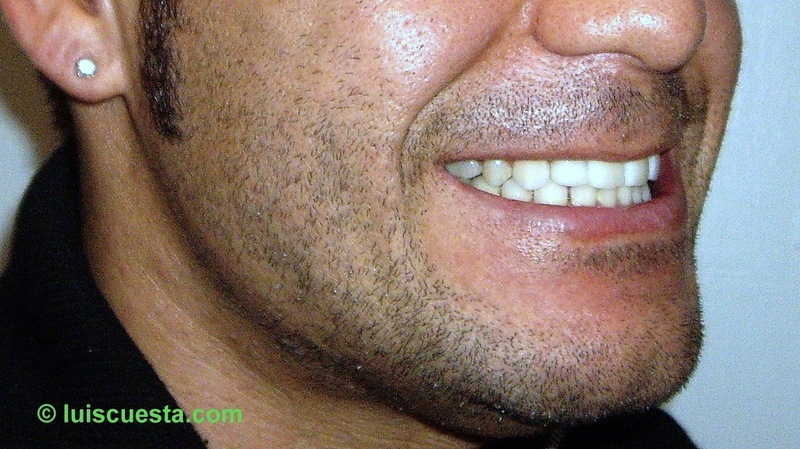 The lower jaw keeps normally enough bone on the anterior region, even in very atrophic cases. This case, from a 77 year-old male, shows more than enough bone kept. 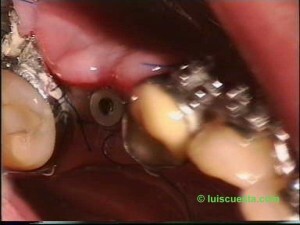 So 3 ICX implants, all three 15” x 3,75” were easily set on the most conveniet places of the lower anterior region. 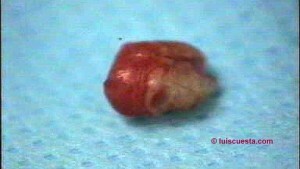 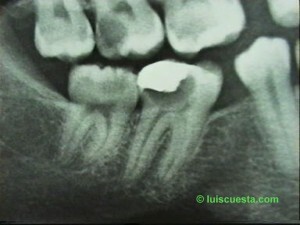 The remainig lower left wisdom tooth was left in place. At 77 years of age and without sympoms and no influence on the therapie, it can as well stay in place. 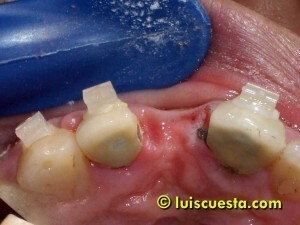 So, after two months the healing caps are changed by ball retainers and the old prosthesis is relined in order to fit the new conectors. 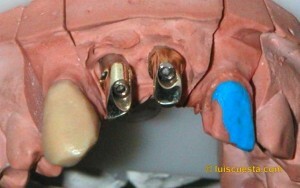 The prosthesis is marked below, exactly where the contact points are. 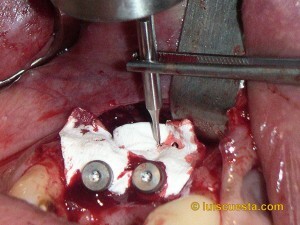 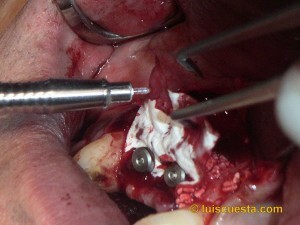 Then comes the drilling until the prosthesis rests freeely on the gums. 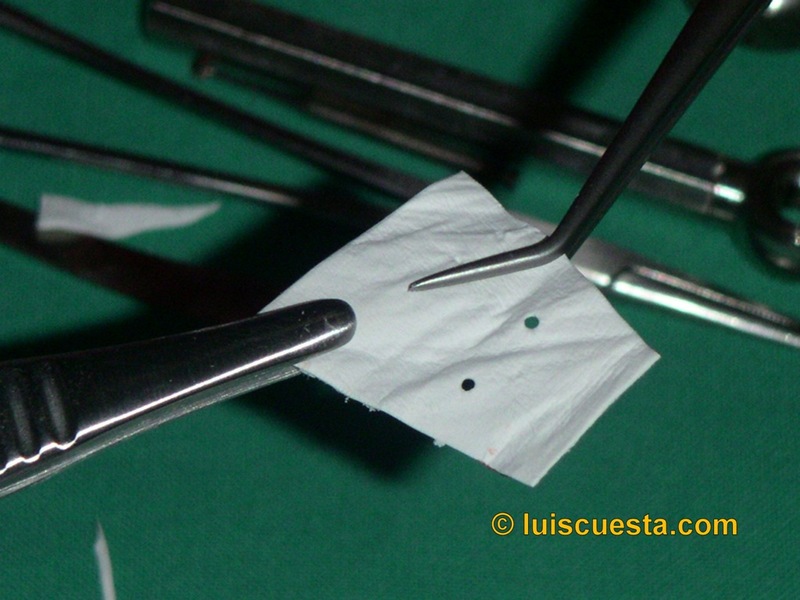 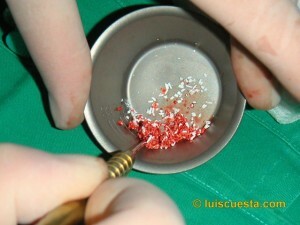 Reline resin is added under the prosthesis. 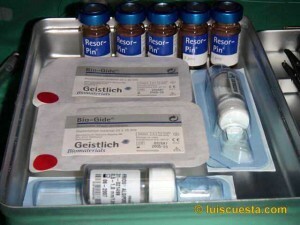 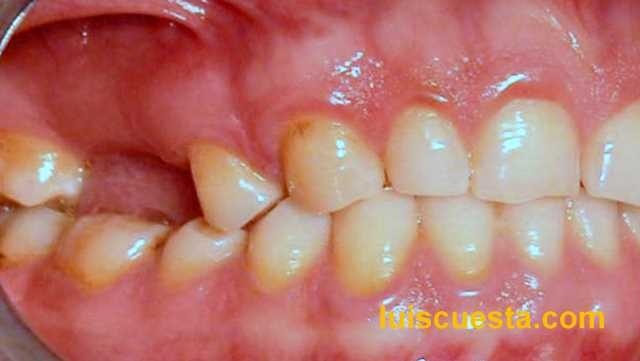 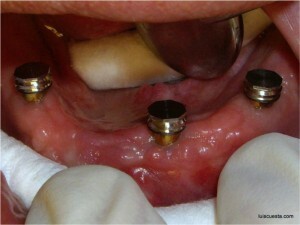 The patient bites in the normal position and the resin selfcures in the mouth. The rubber rings inside the stainless steel structure can be chosen in three differente degrees of hardness and retention. They wear out like every rubber component and can be therefore easily changed. 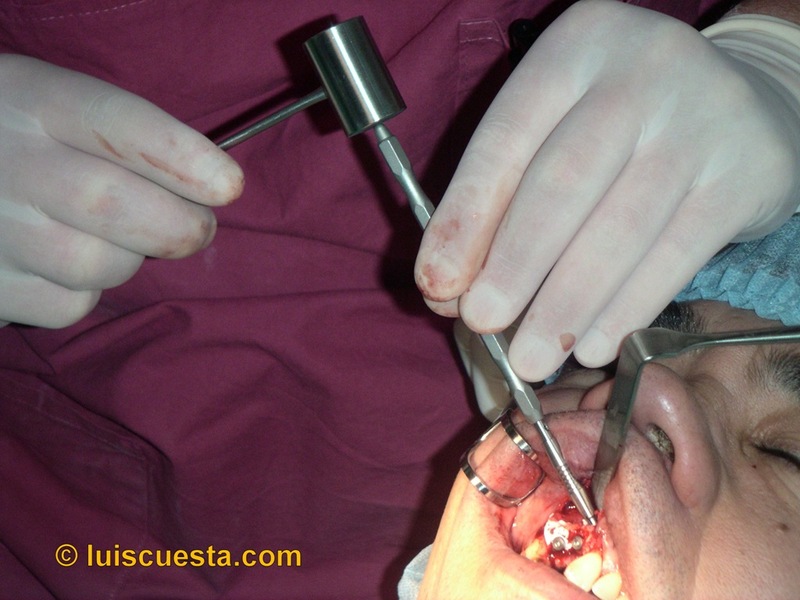 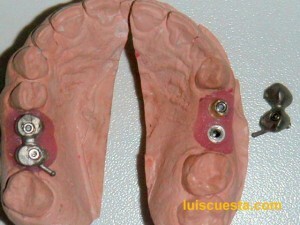 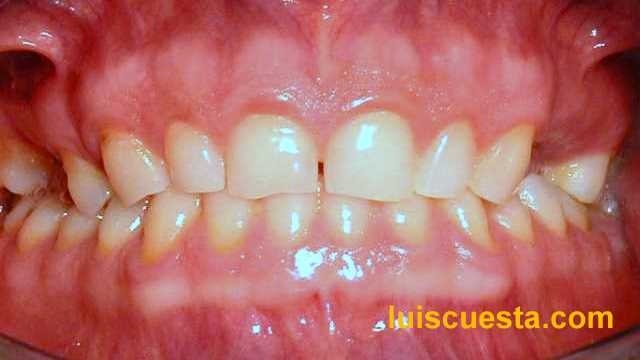 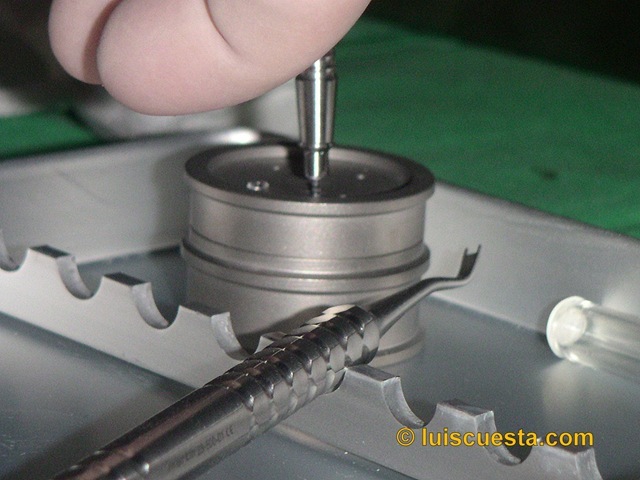 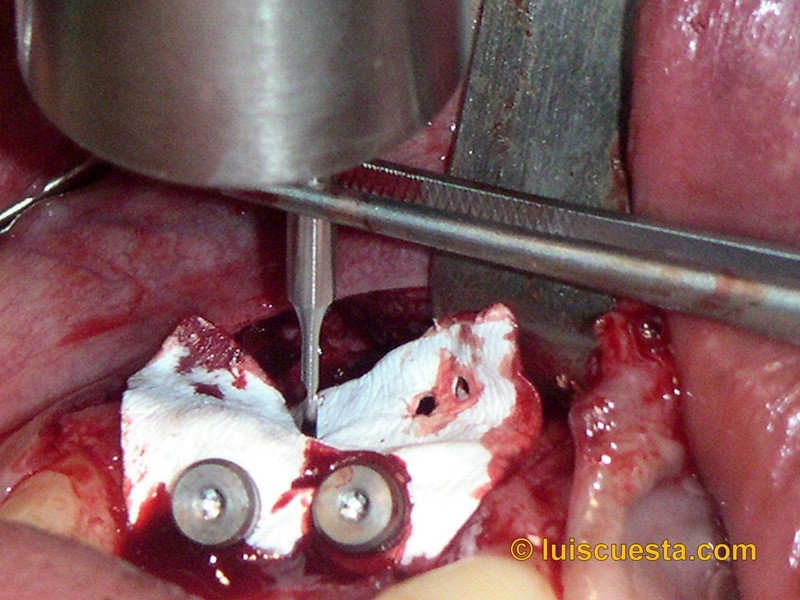 After a few minutes cure time the retainers are already fixed and the retaining force can already be appreciated, as the prosthesis stays in the right position although the tongue and the cheeks exert the same force as before. 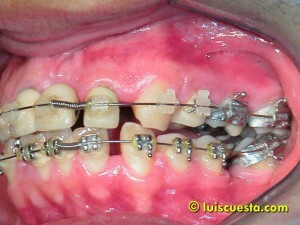 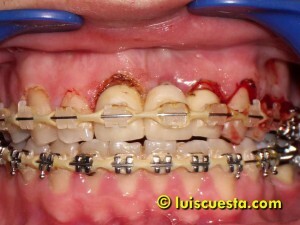 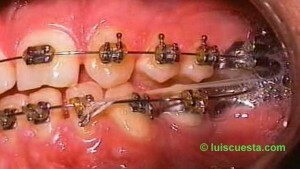 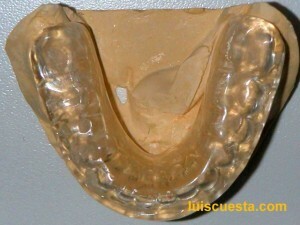 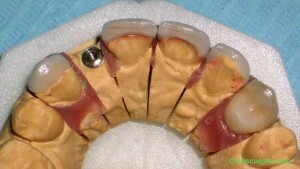 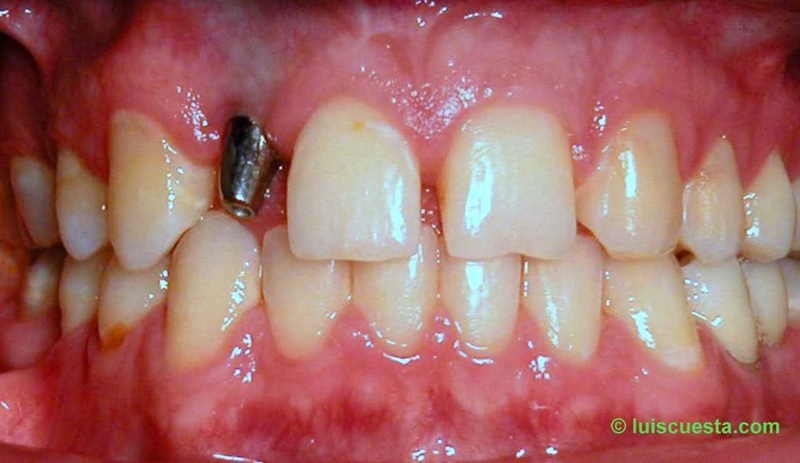 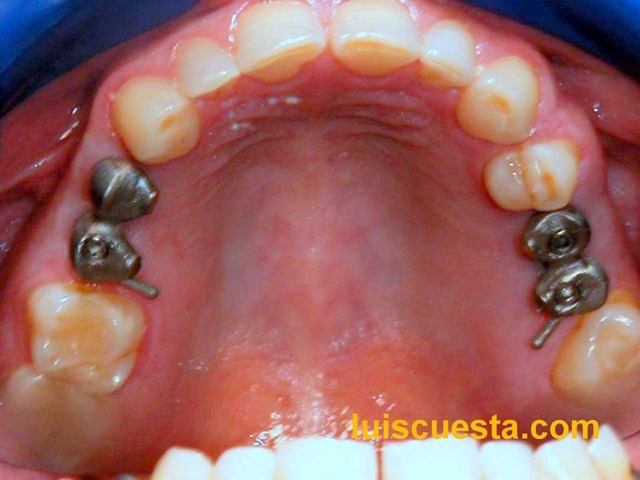 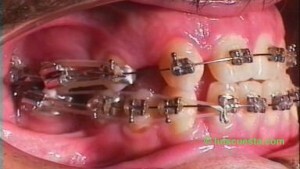 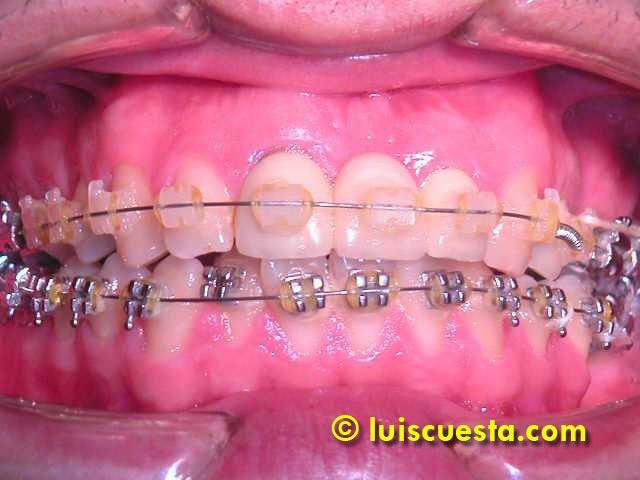 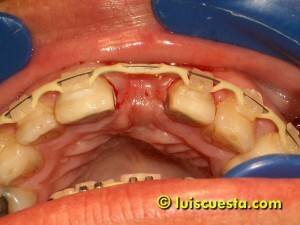 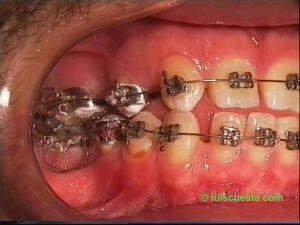 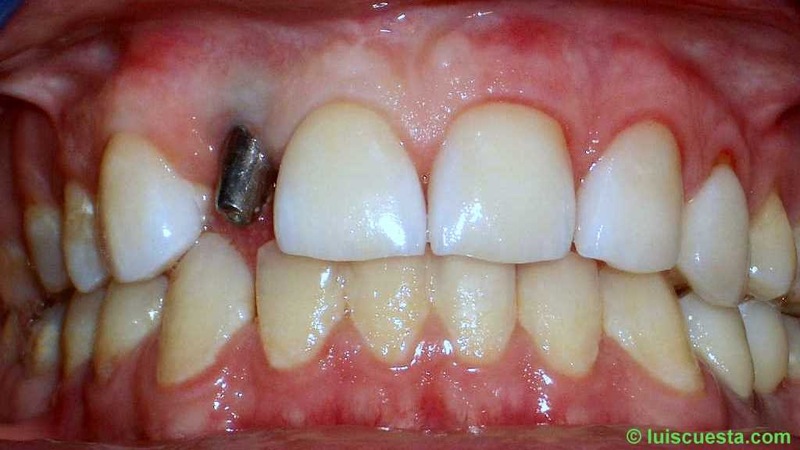 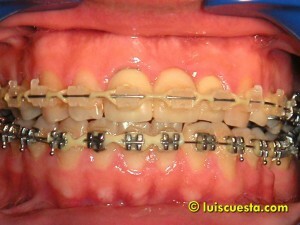 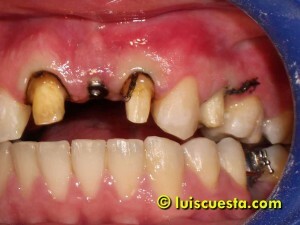 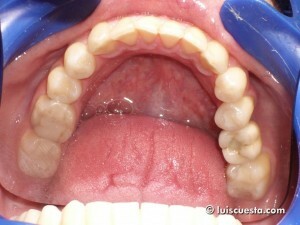 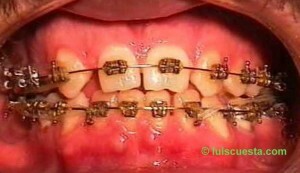 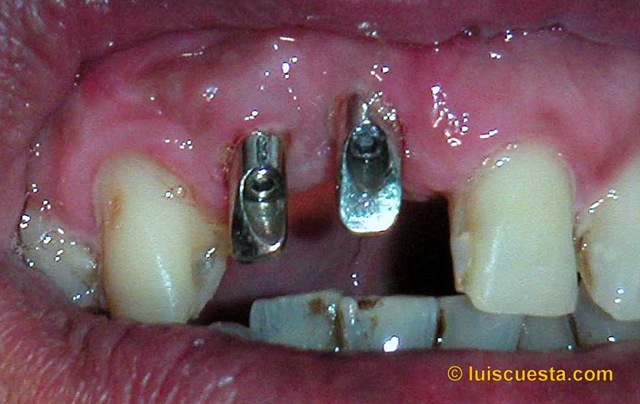 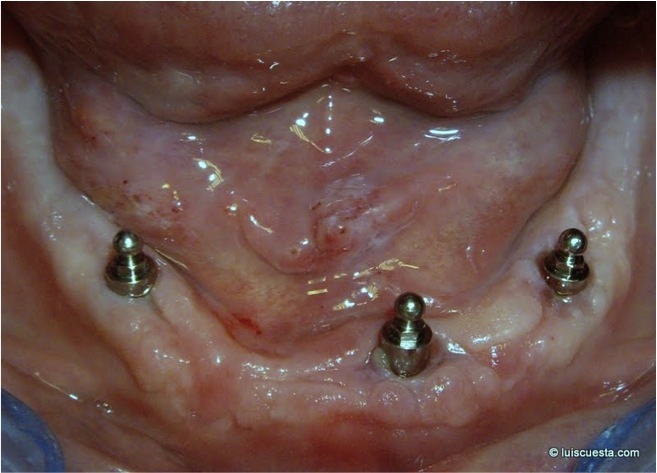 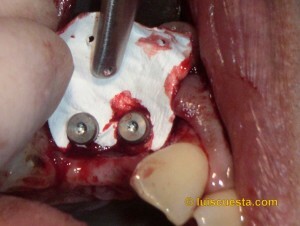 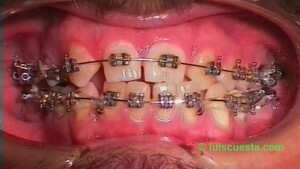 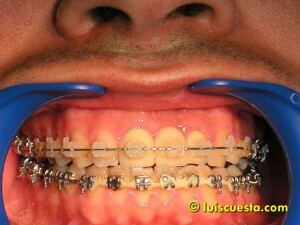 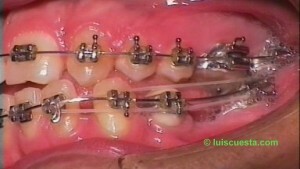 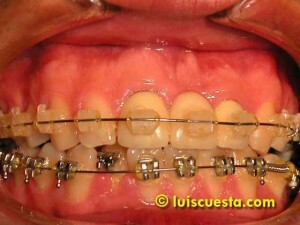 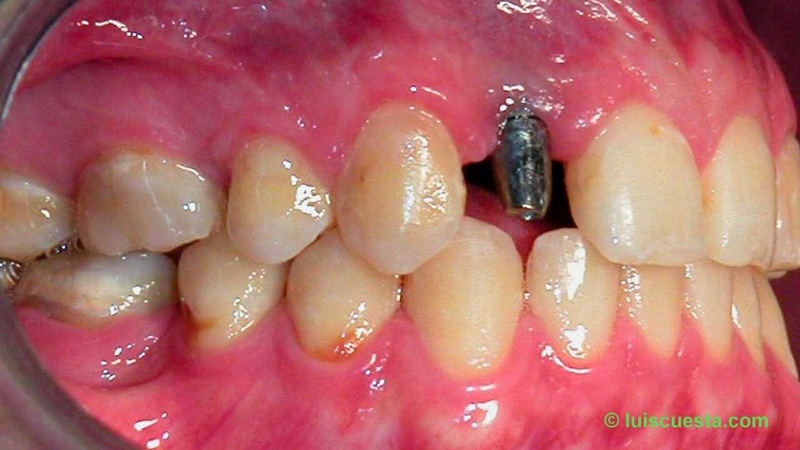 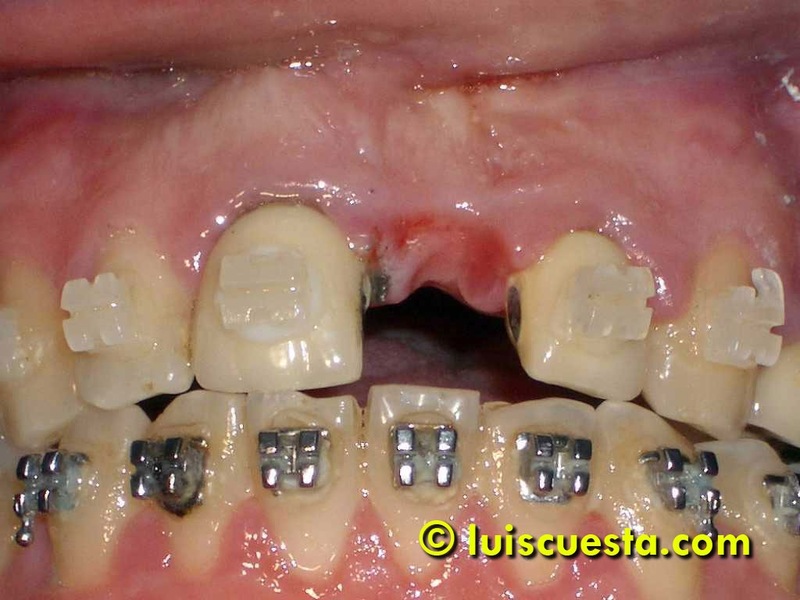 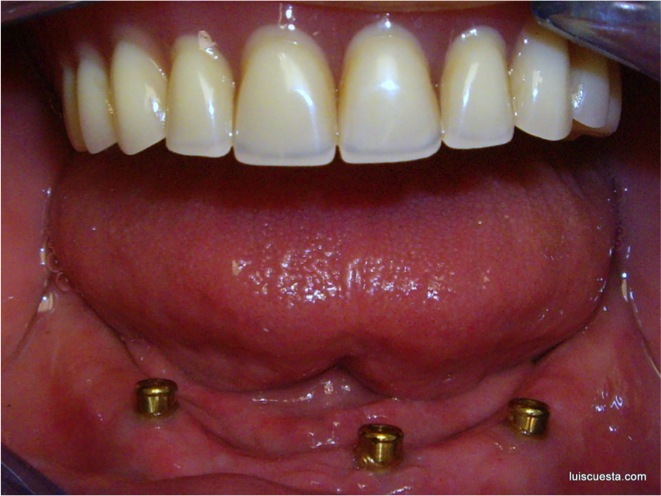 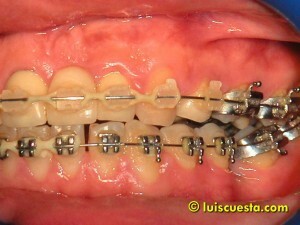 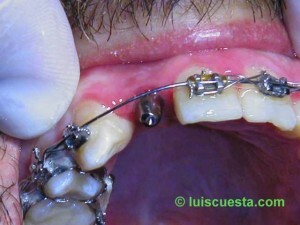 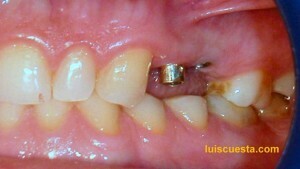 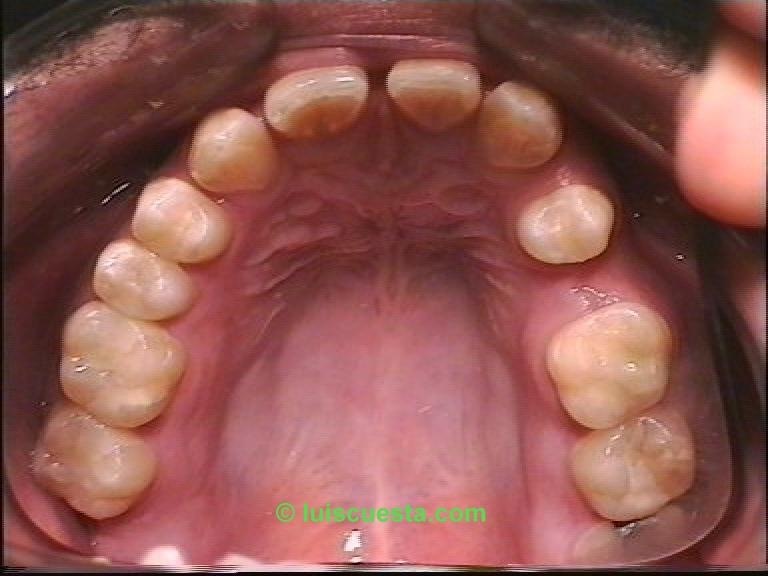 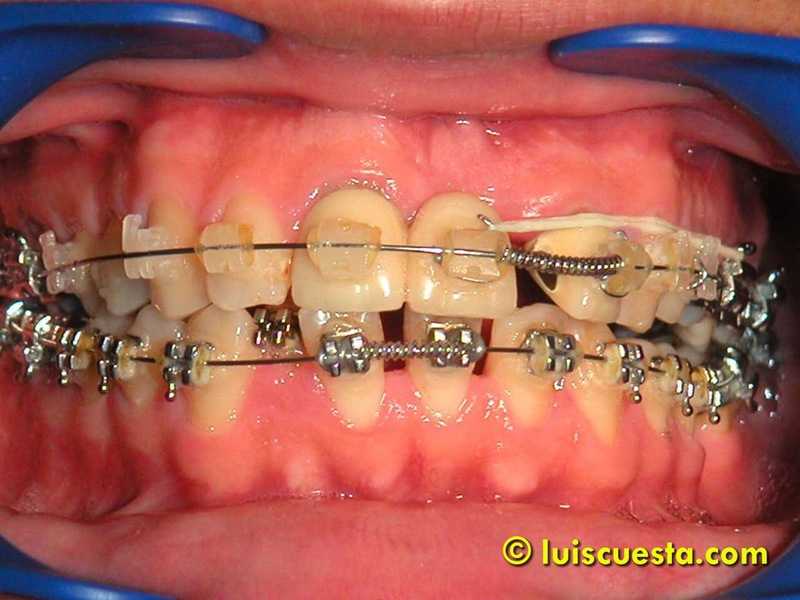 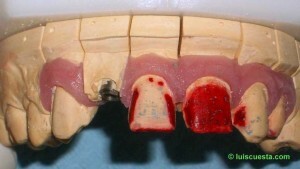 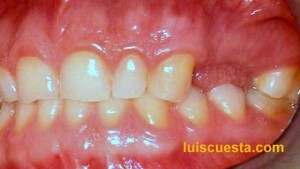 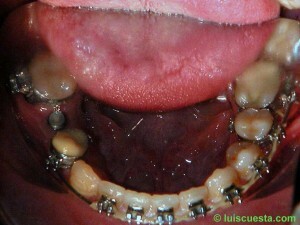 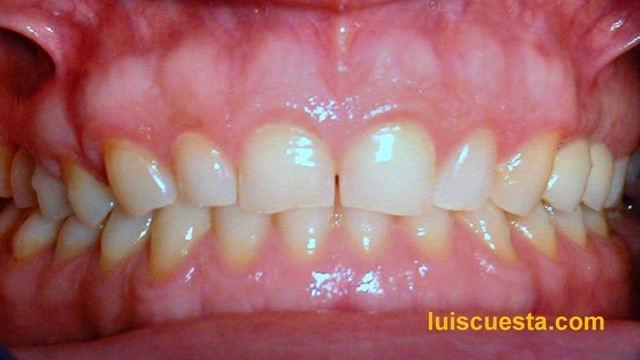 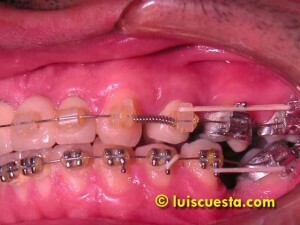 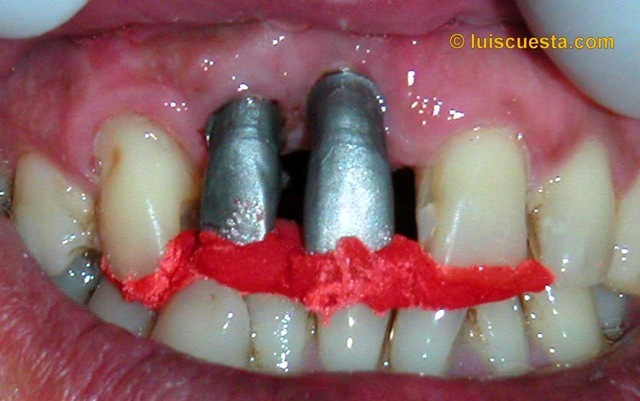 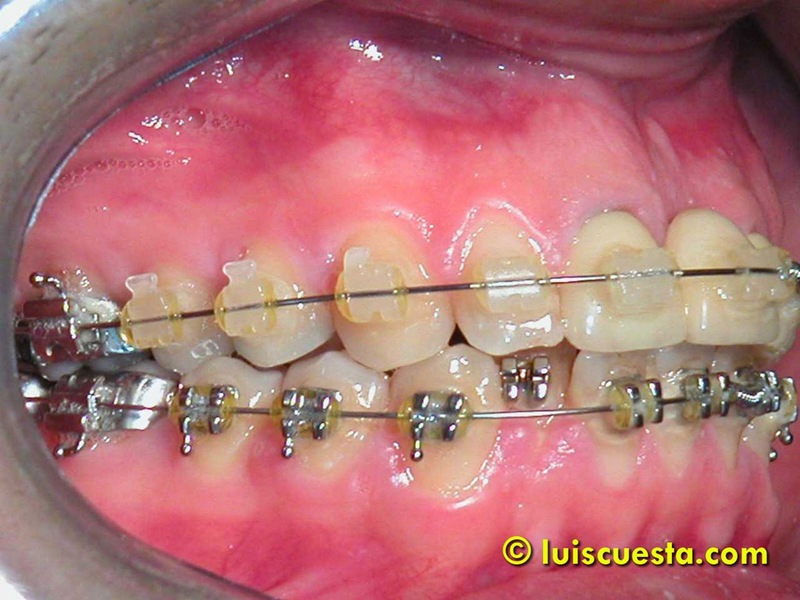 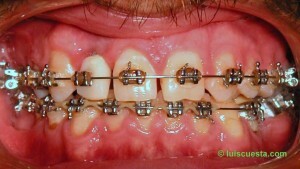 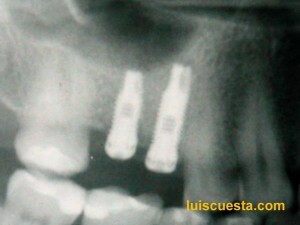 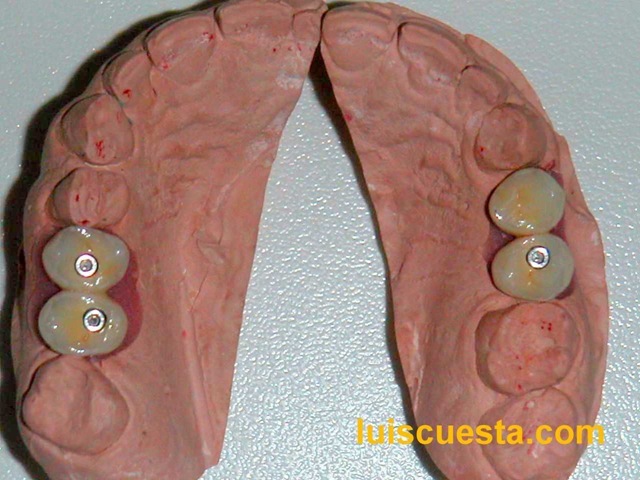 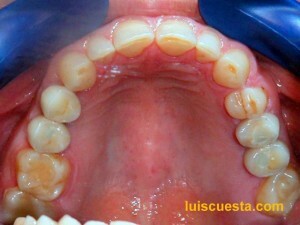 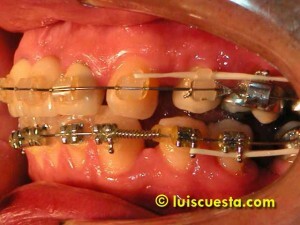 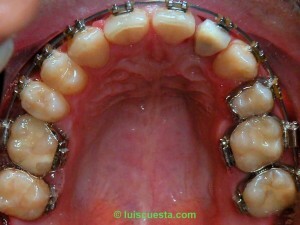 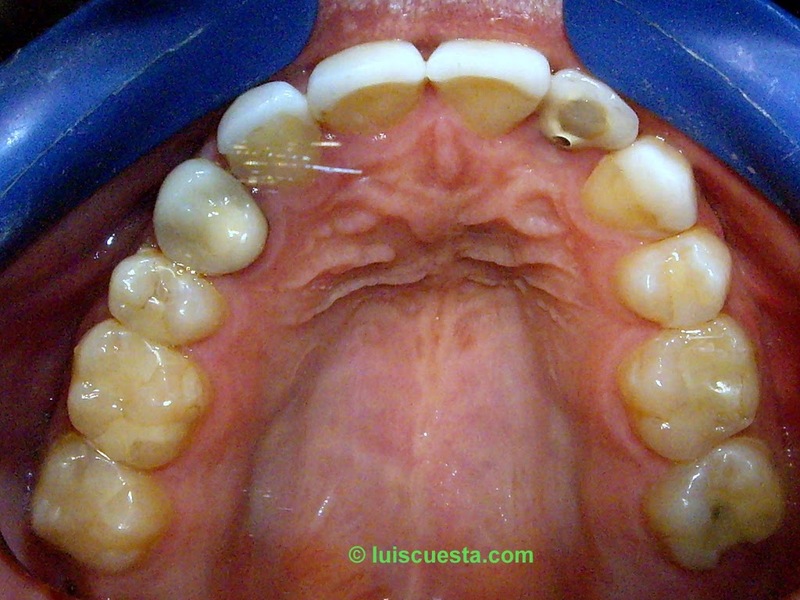 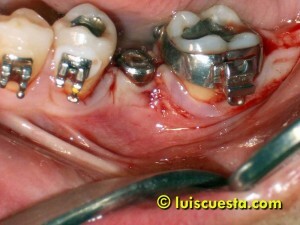 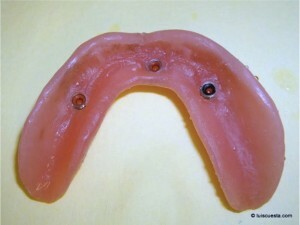 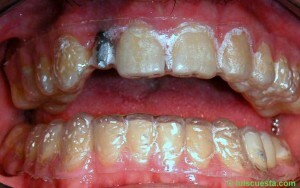 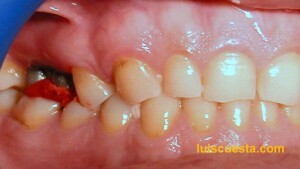 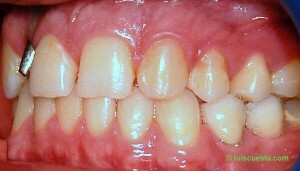 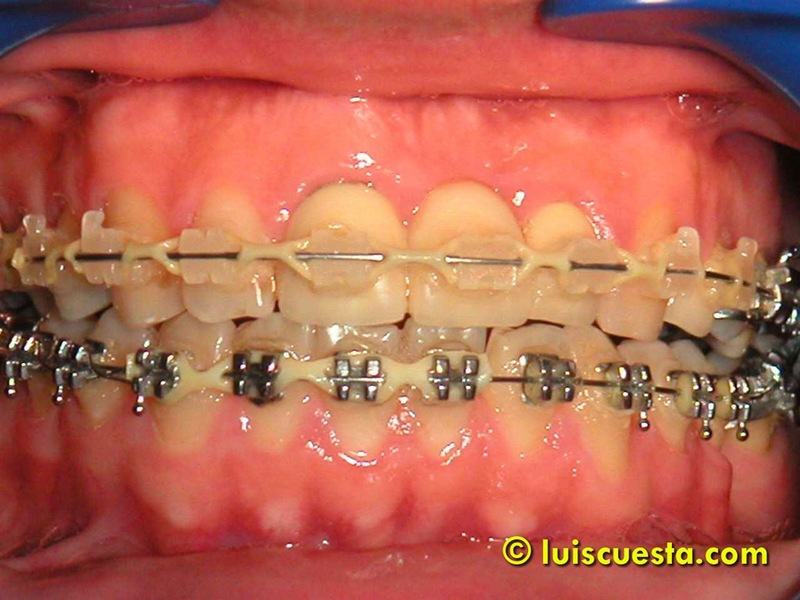 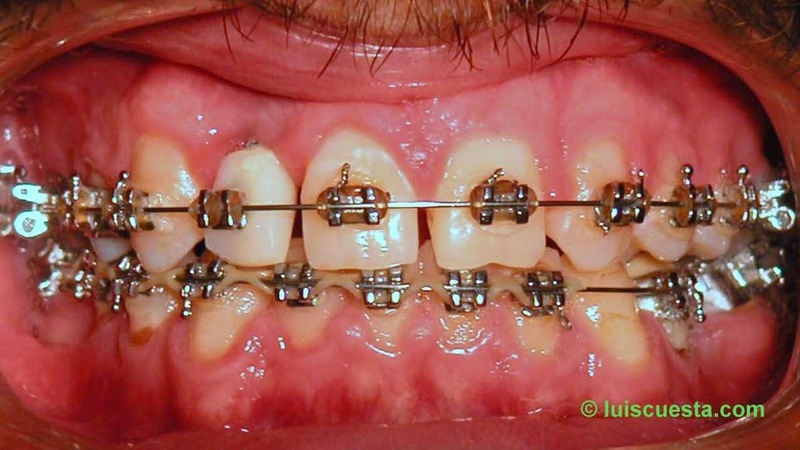 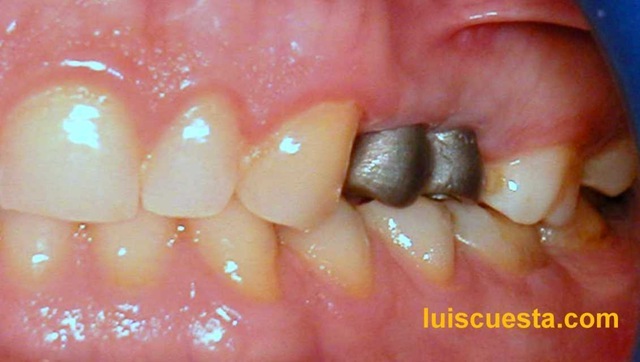 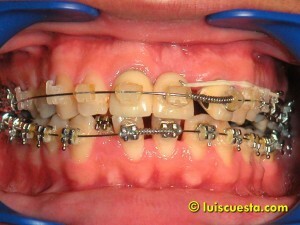 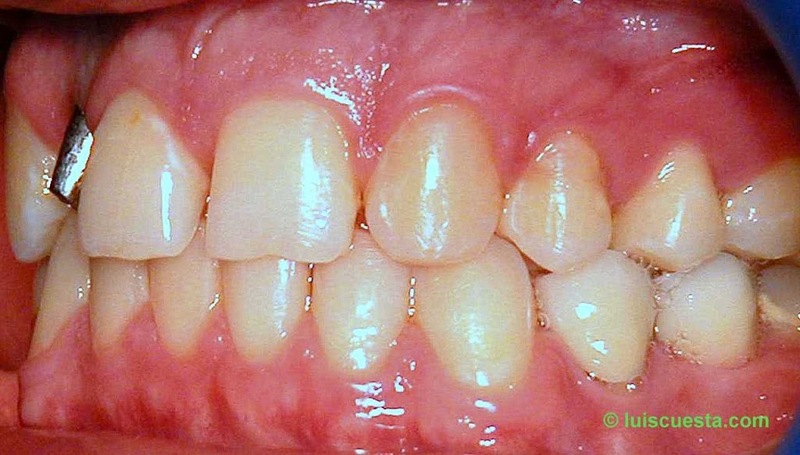 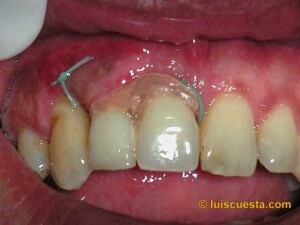 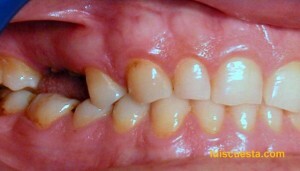 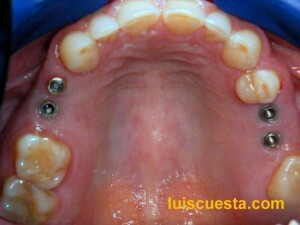 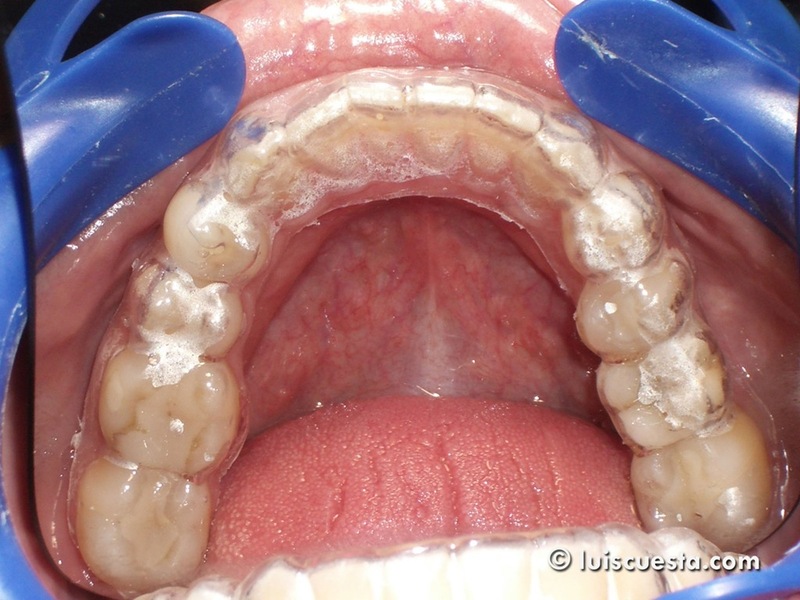 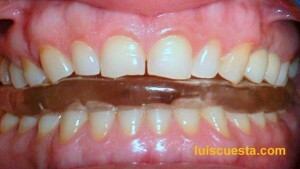 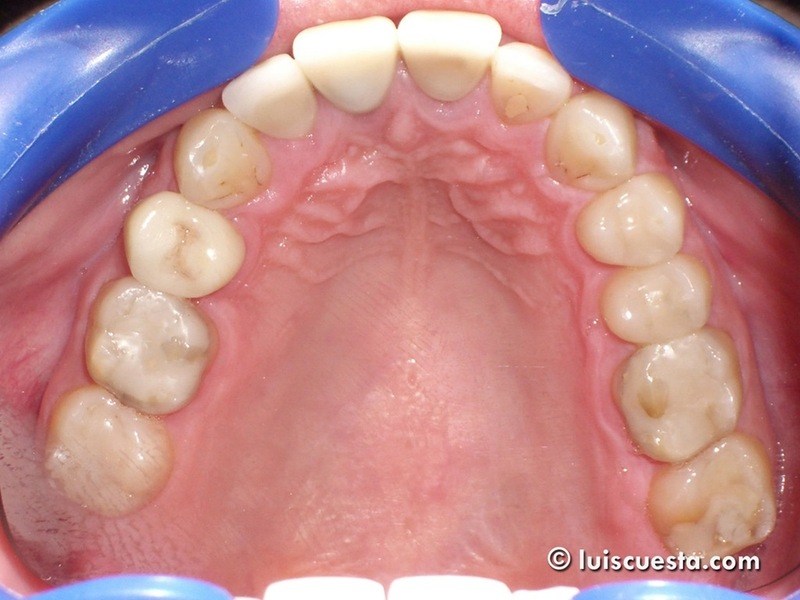 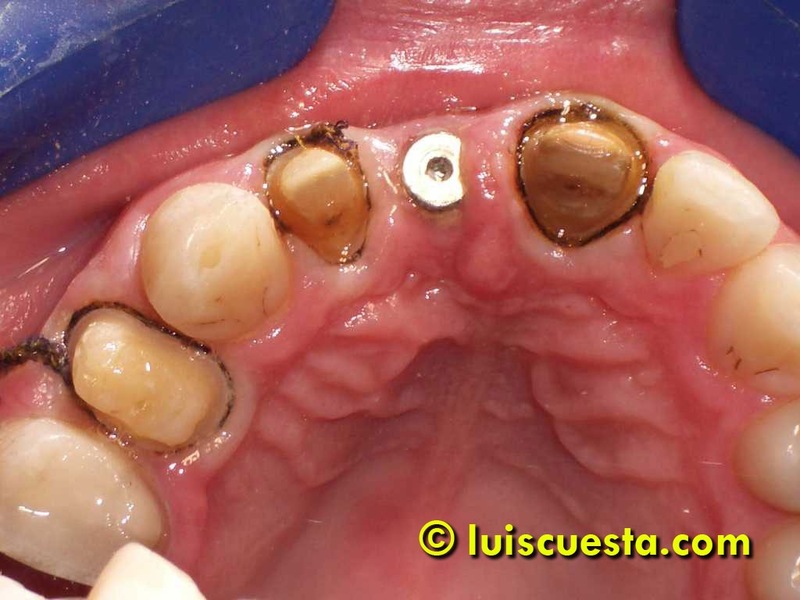 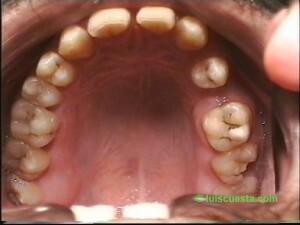 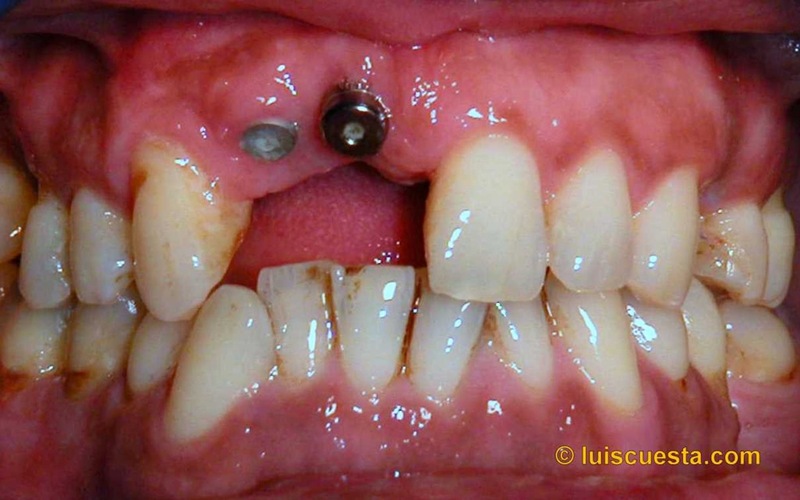 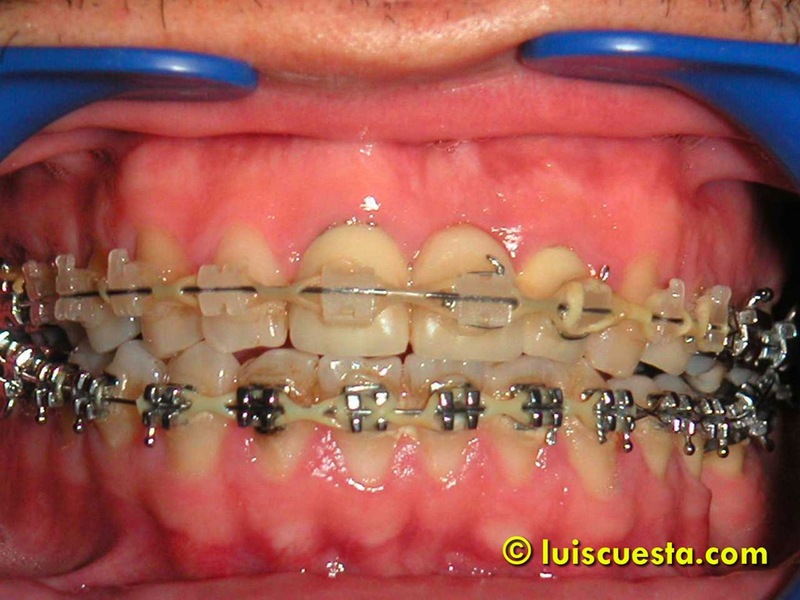 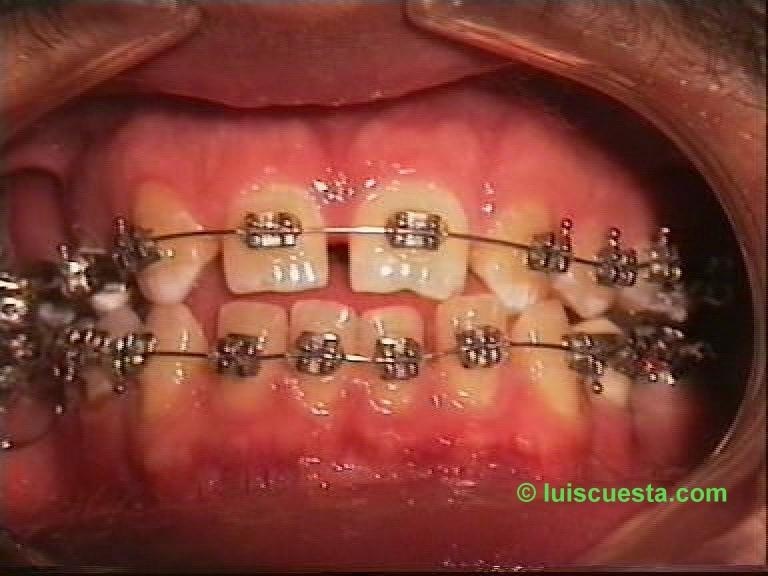 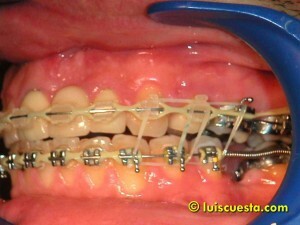 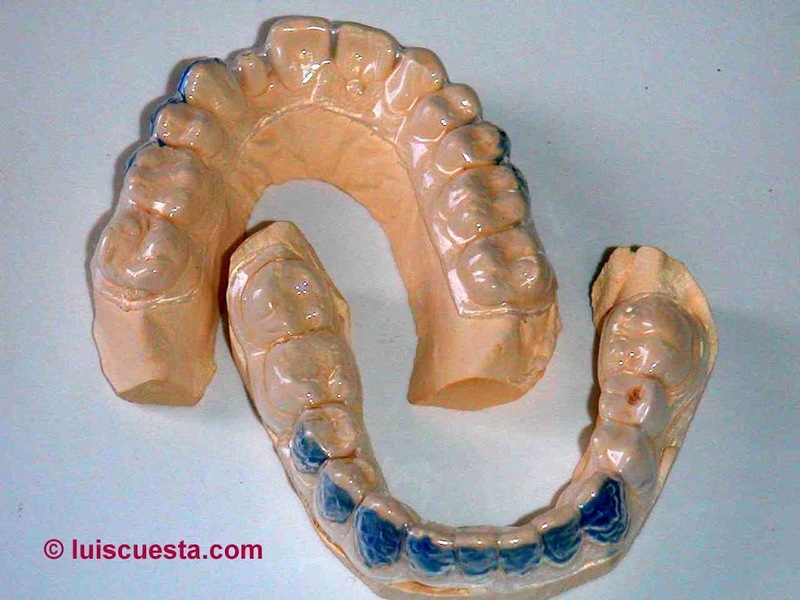 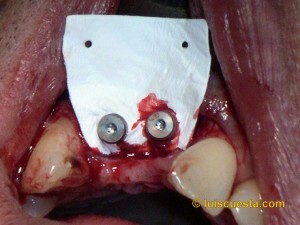 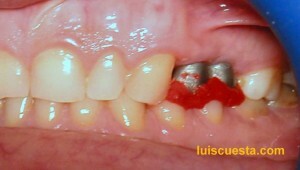 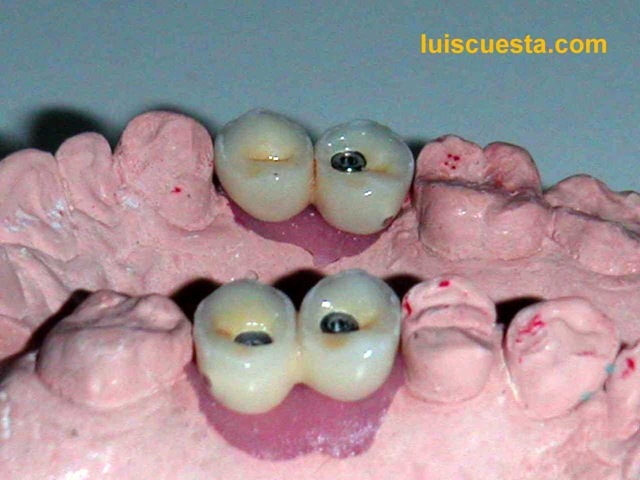 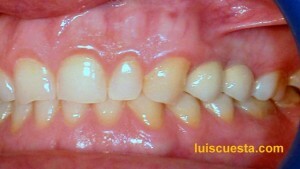 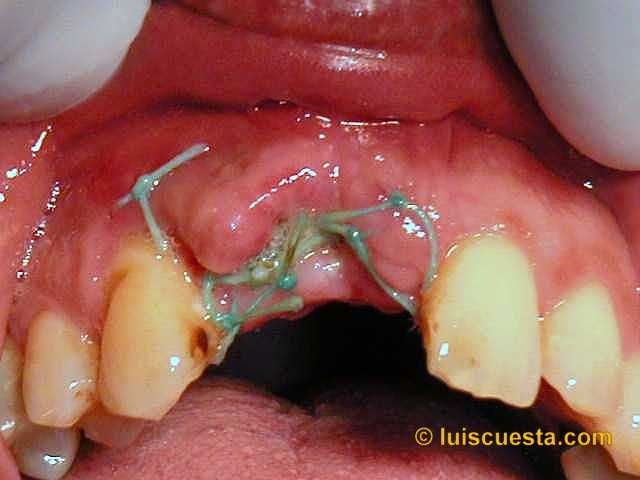 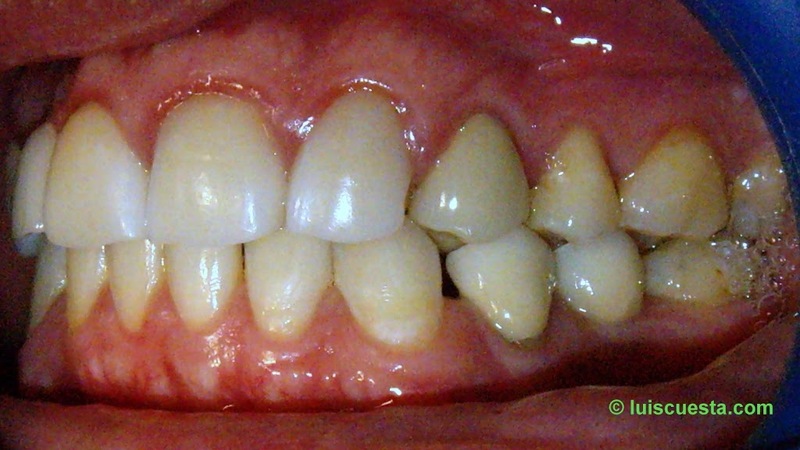 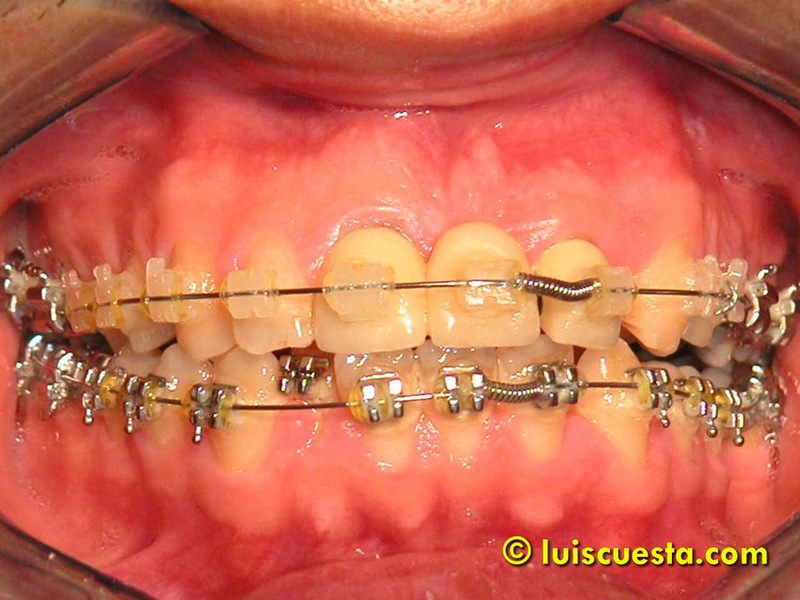 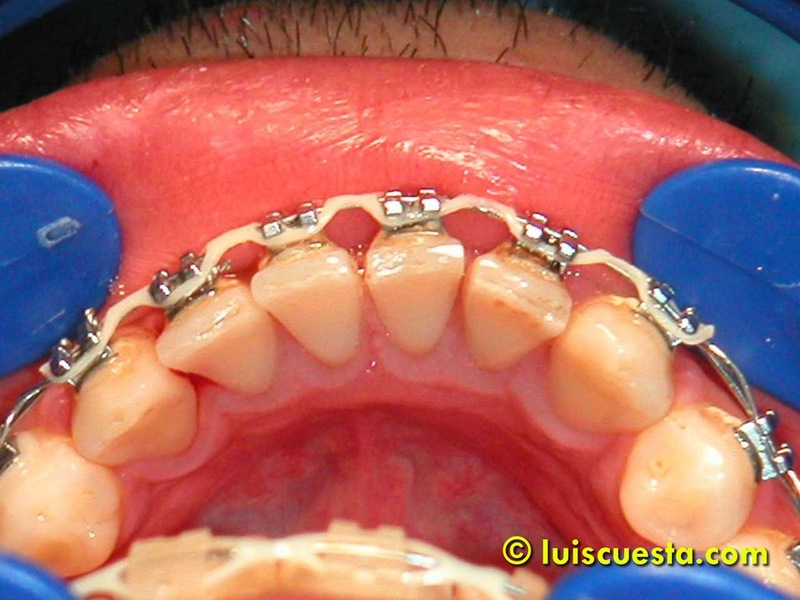 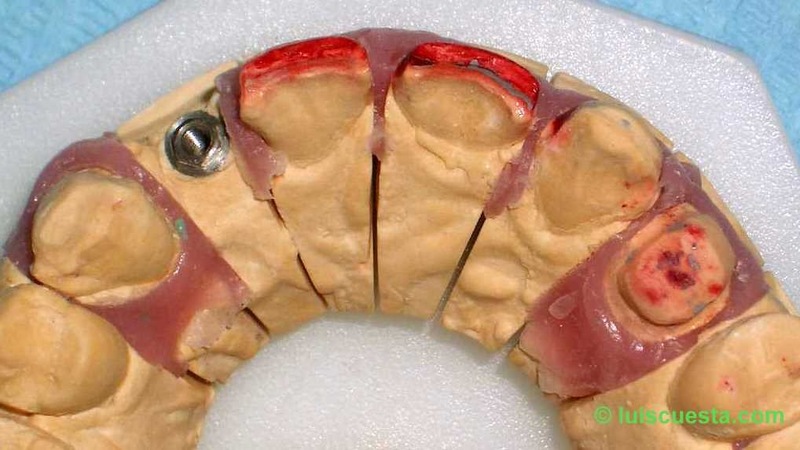 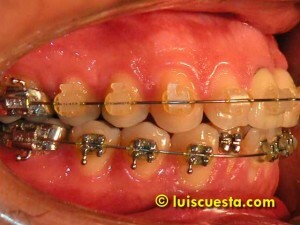 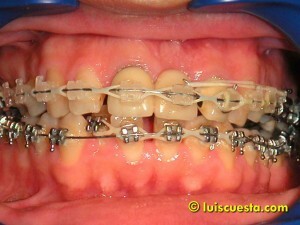 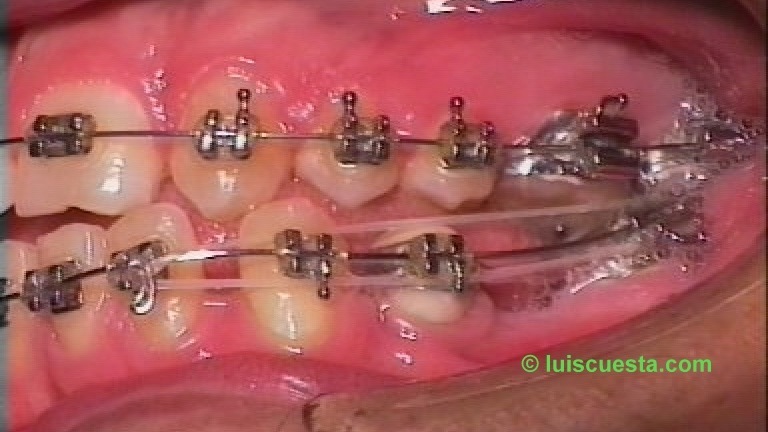 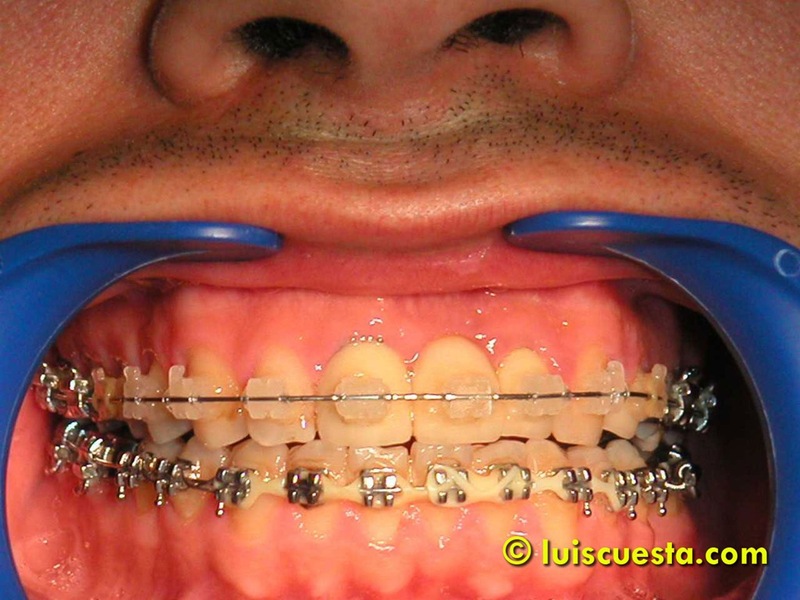 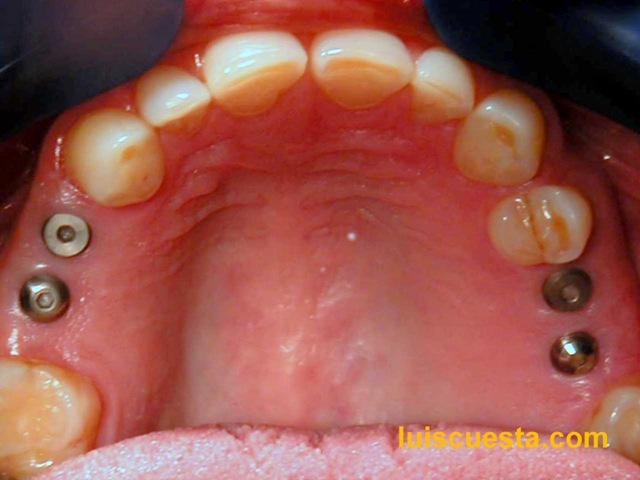 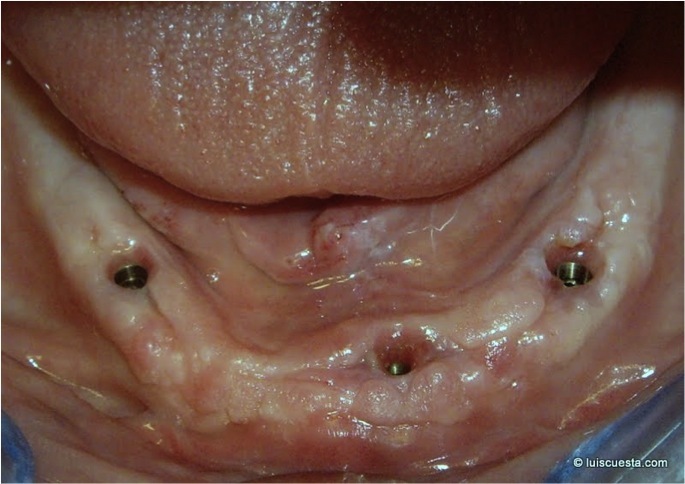 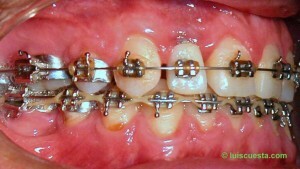 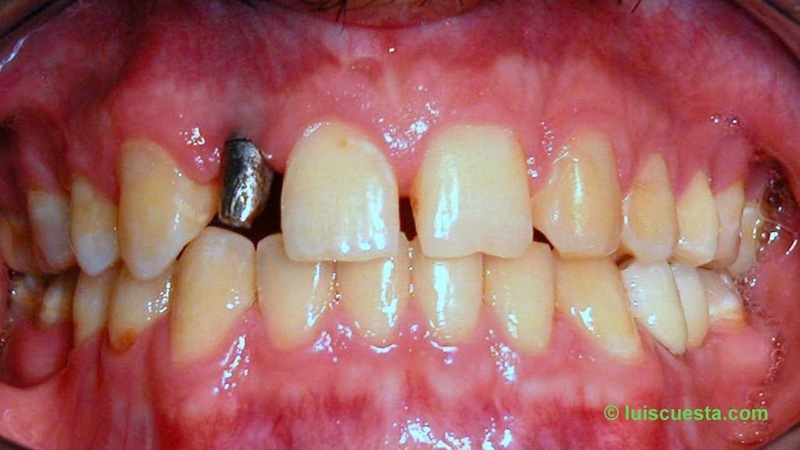 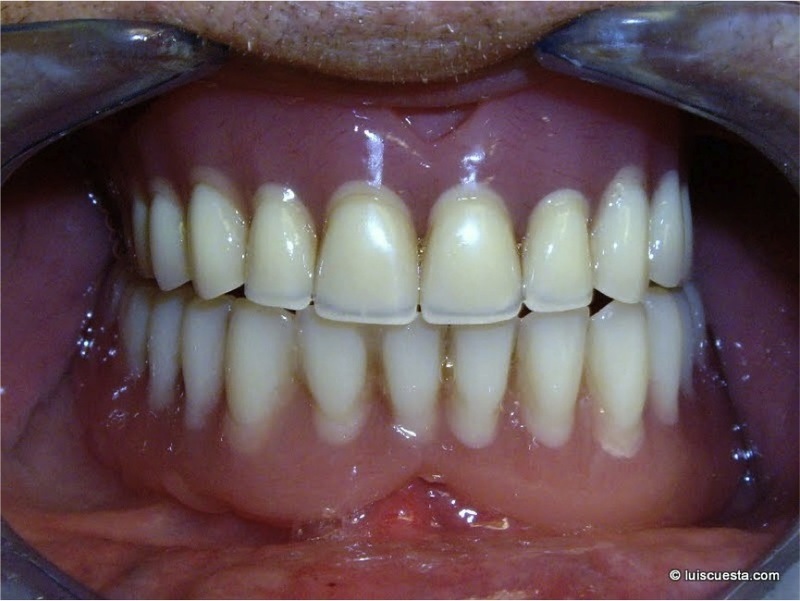 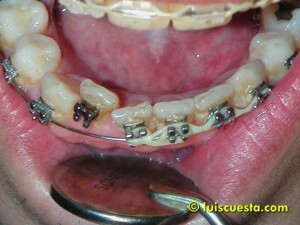 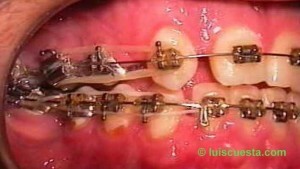 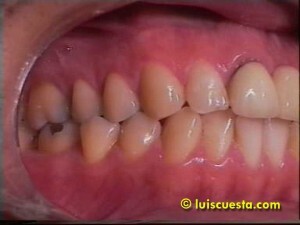 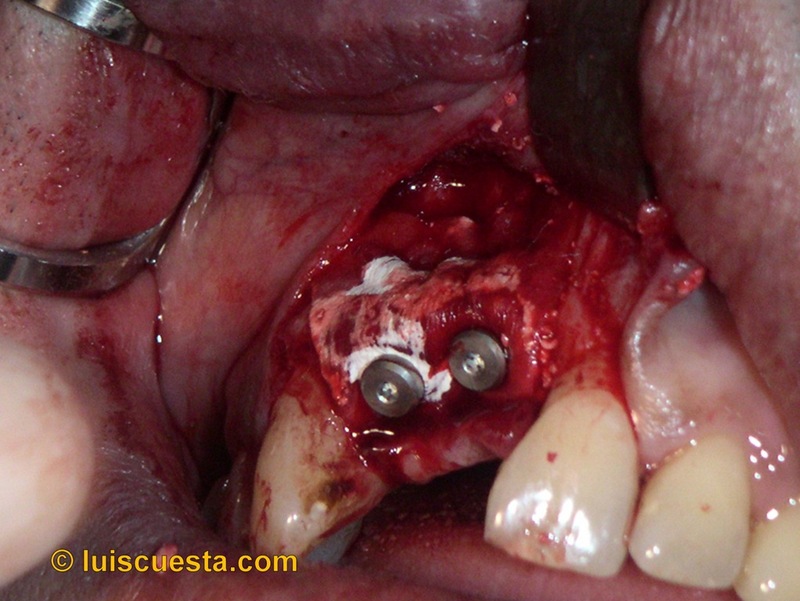 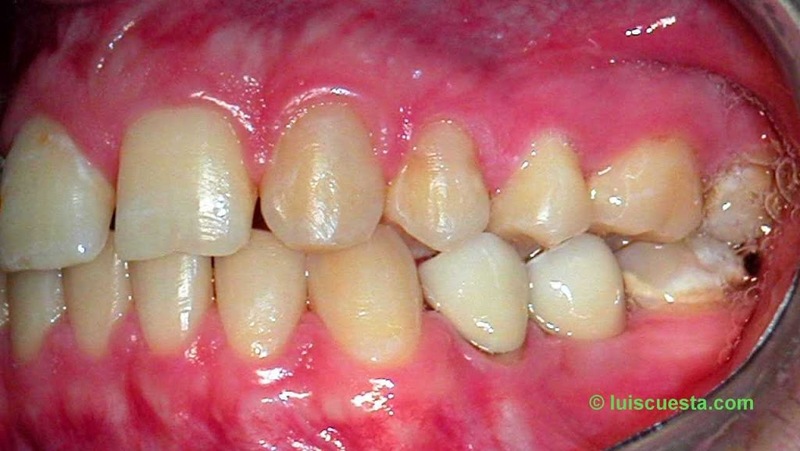 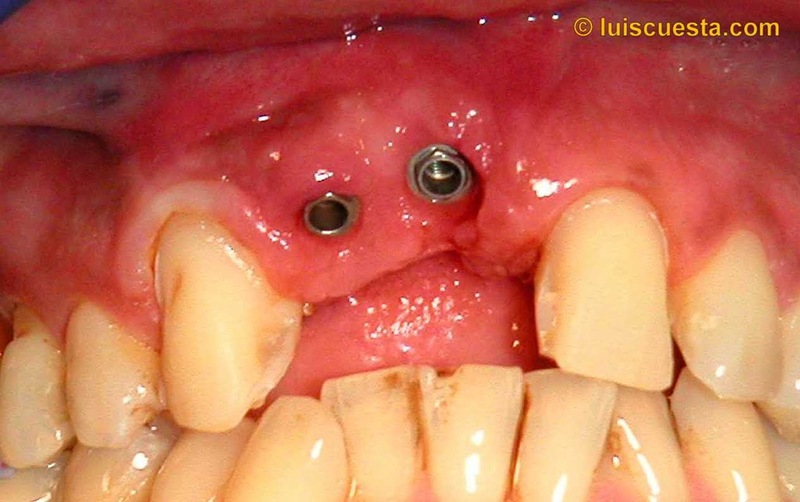 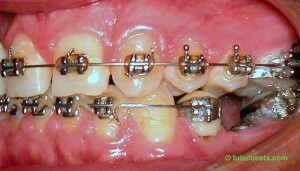 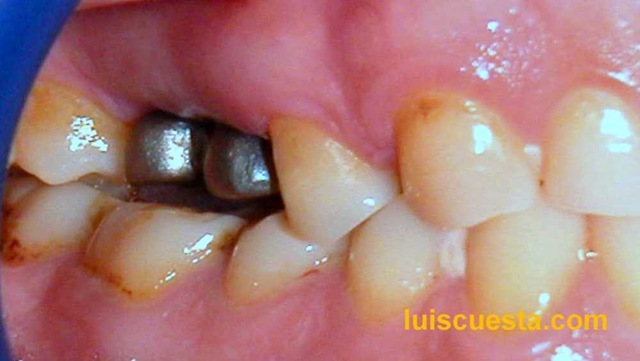 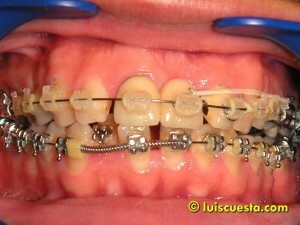 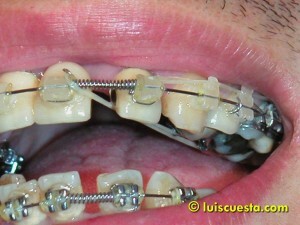 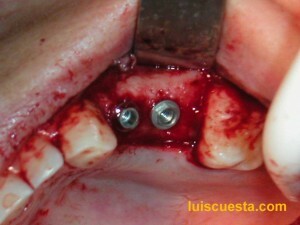 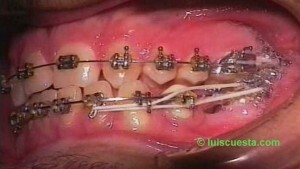 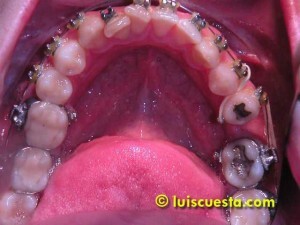 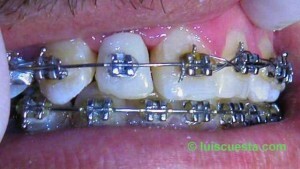 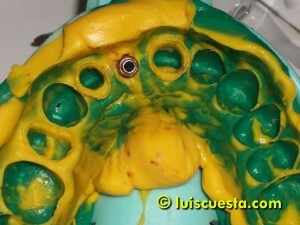 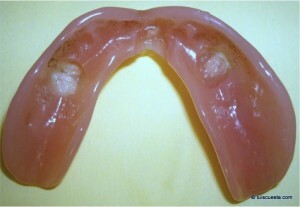 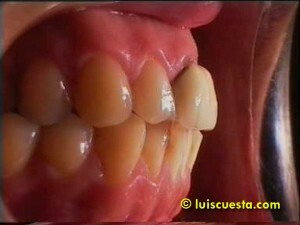 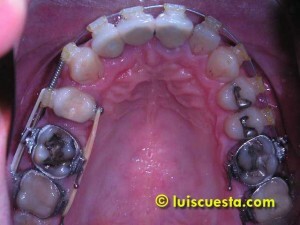 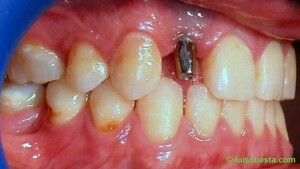 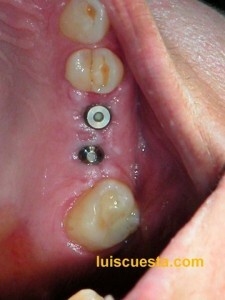 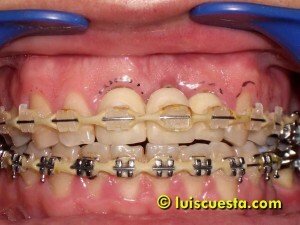 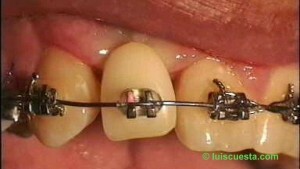 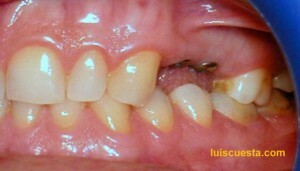 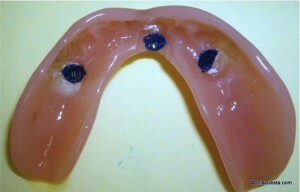 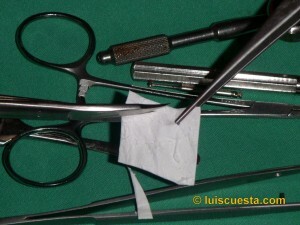 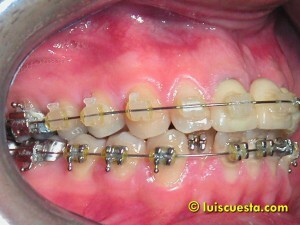 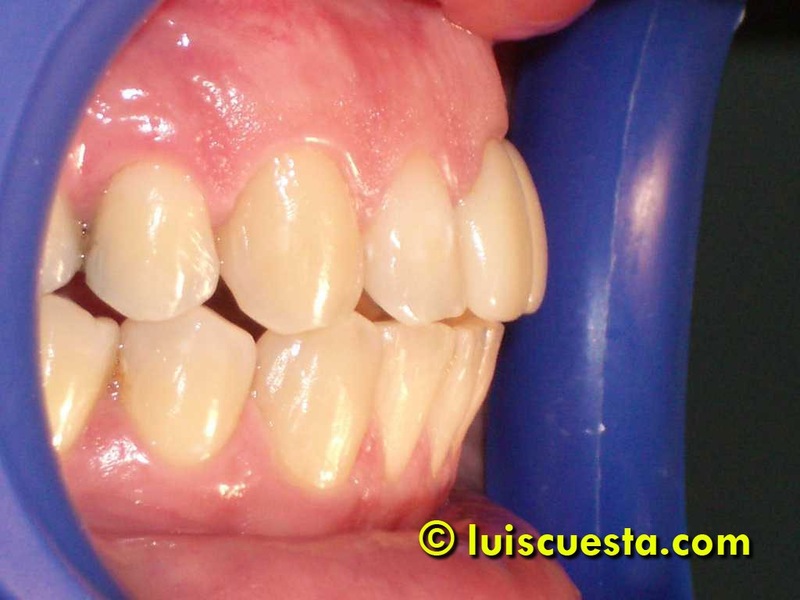 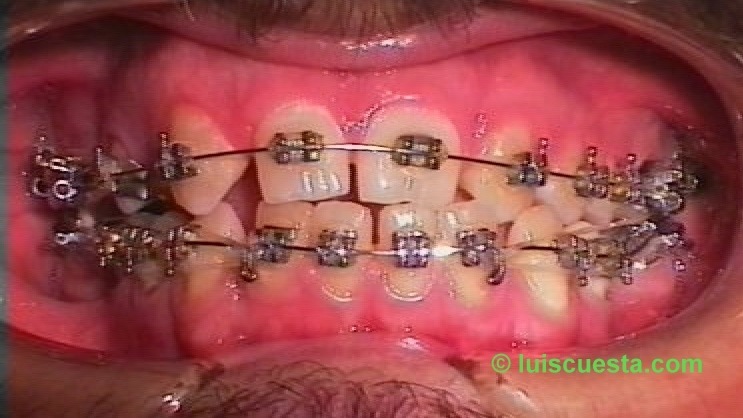 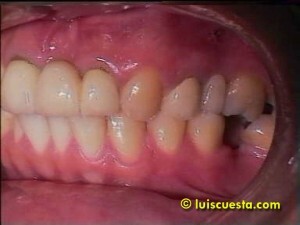 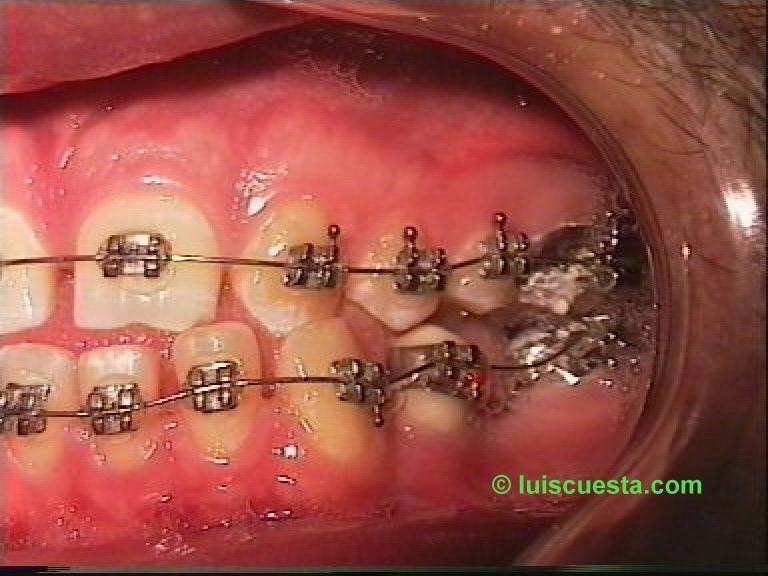 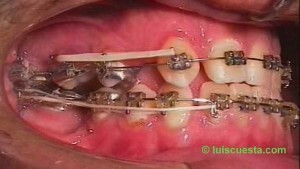 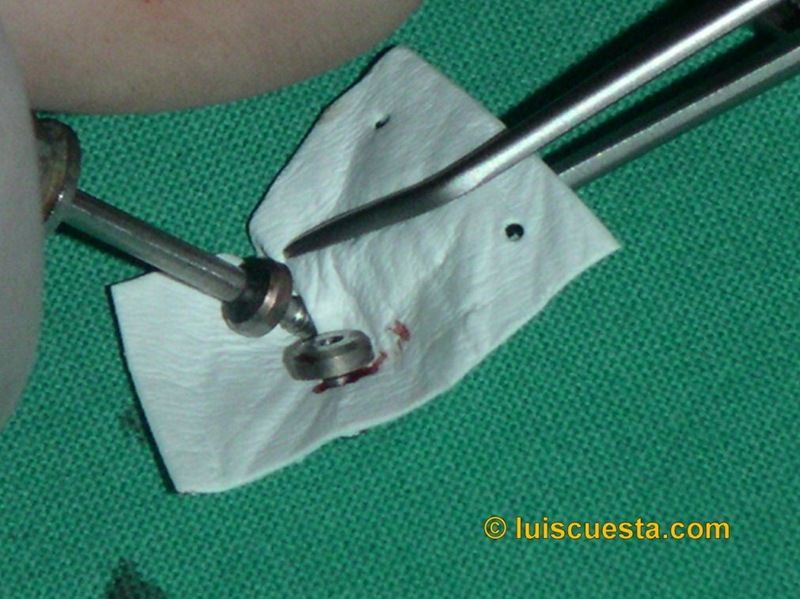 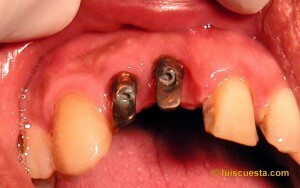 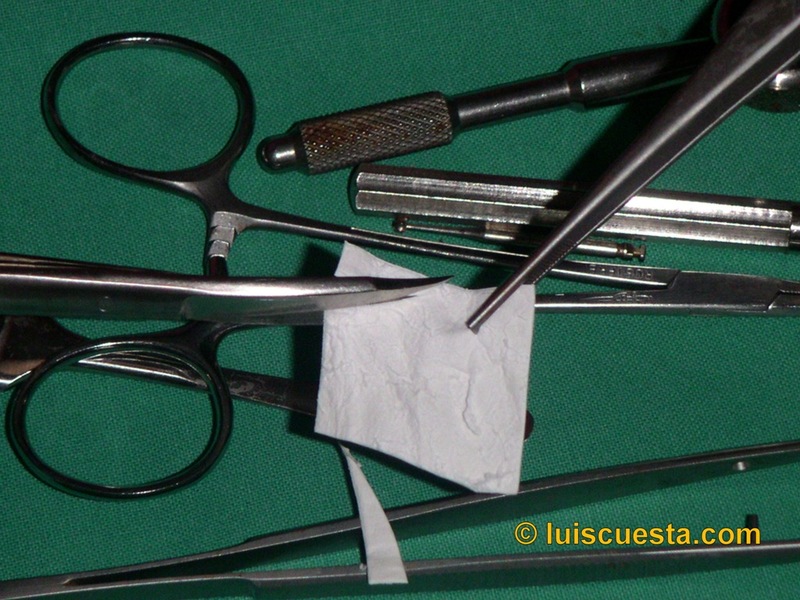 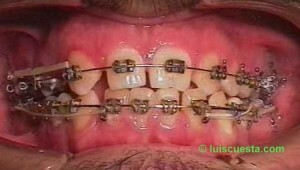 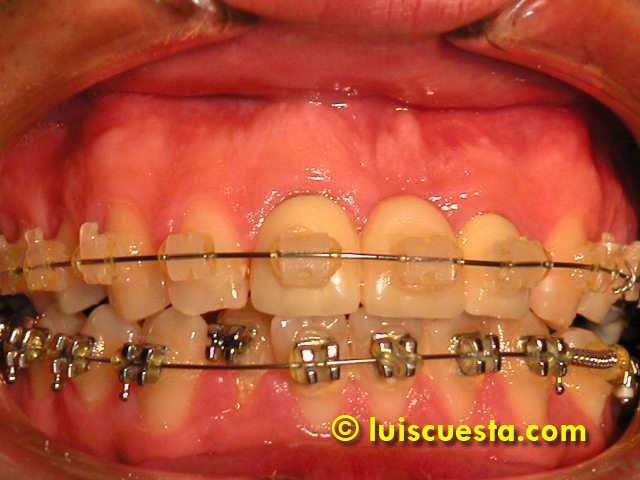 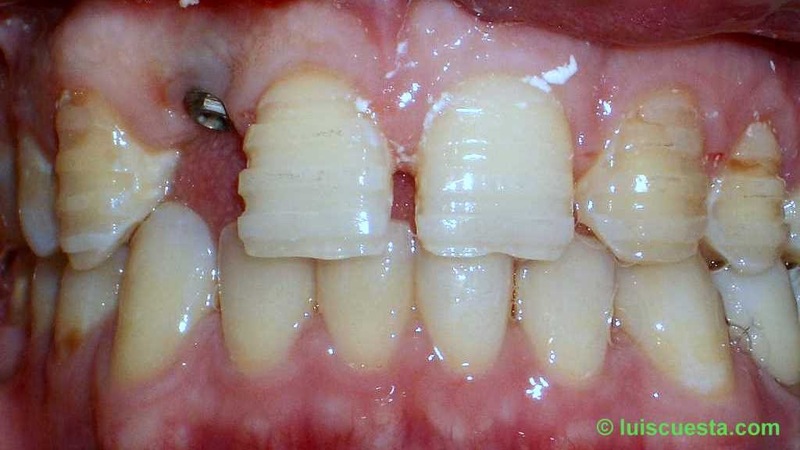 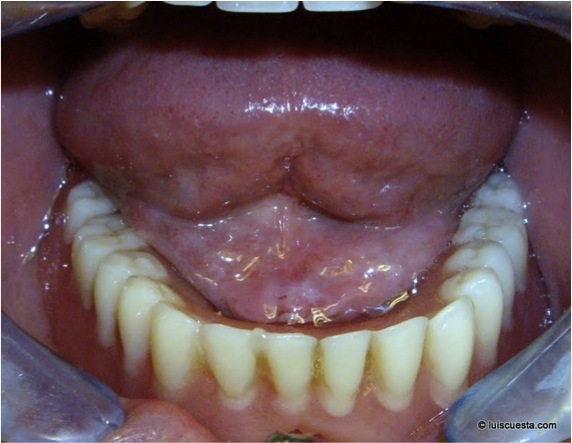 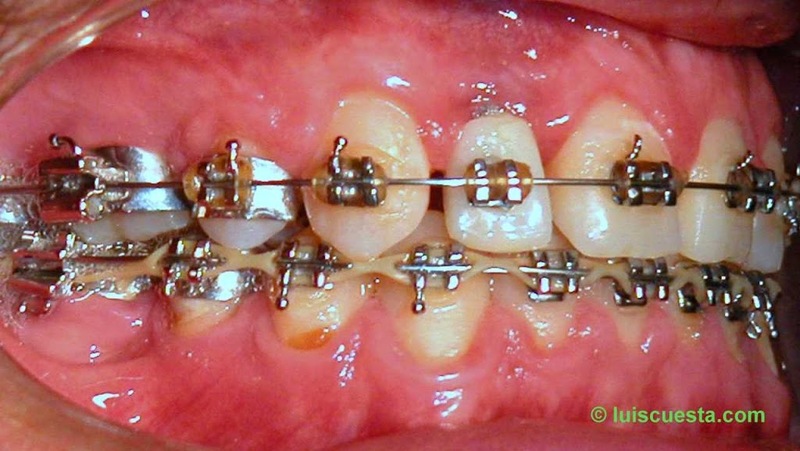 In this case, the three ball retainers proved not to be retentive enough for the patient. 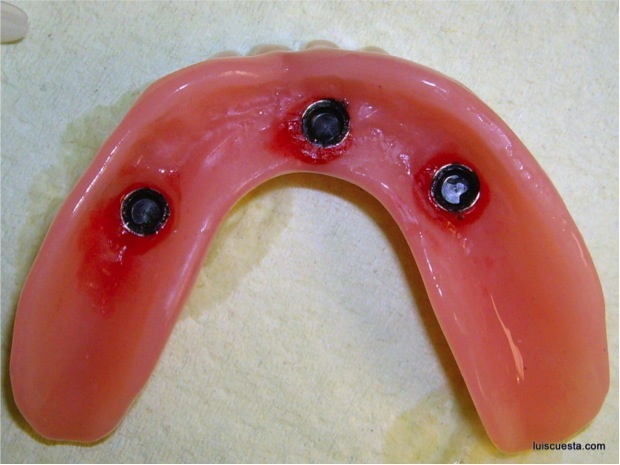 Normally a four implant solution provides a more retentive, more stable, four-point trapezoidal support. Nut the patient was running on a low budget and we had to go for a three implant display, with the central implant close to the mandibular synfisis. 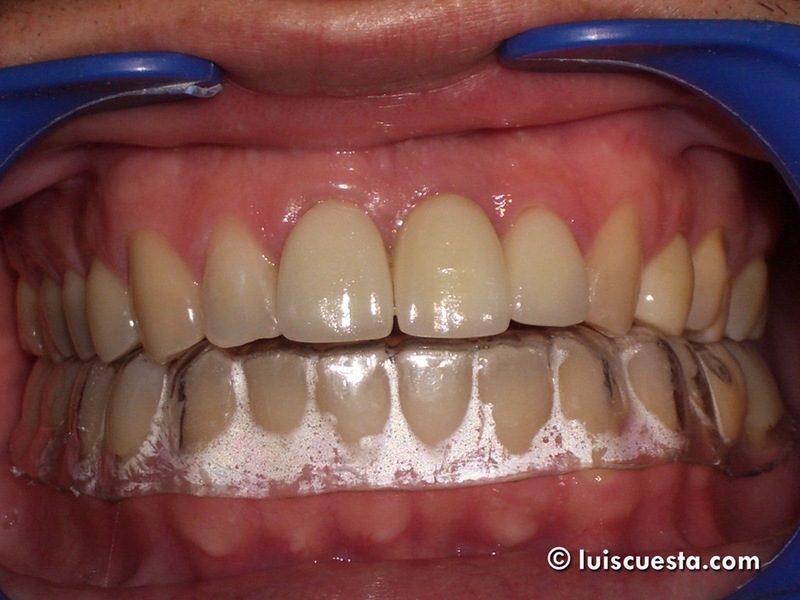 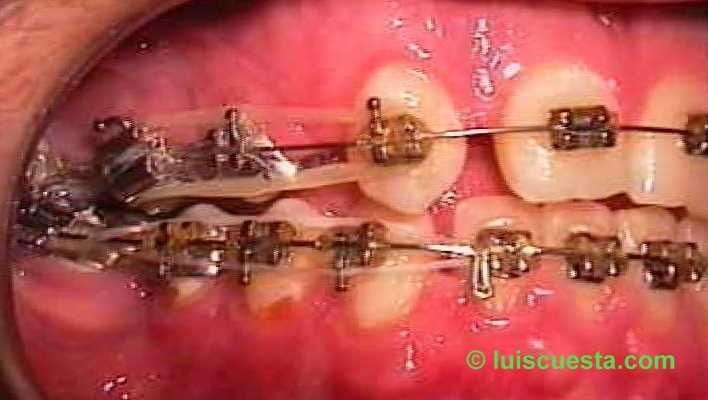 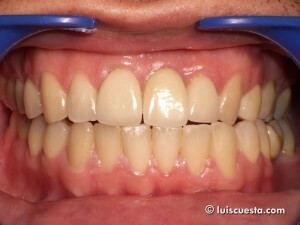 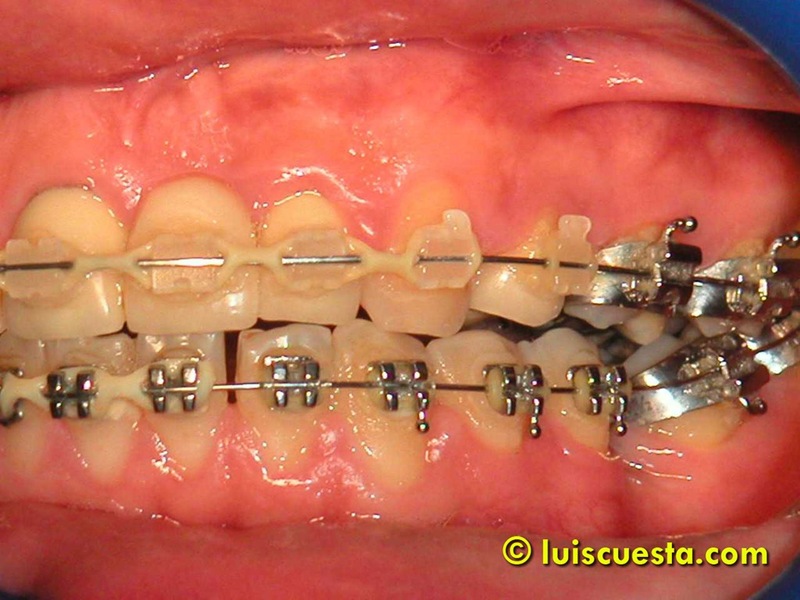 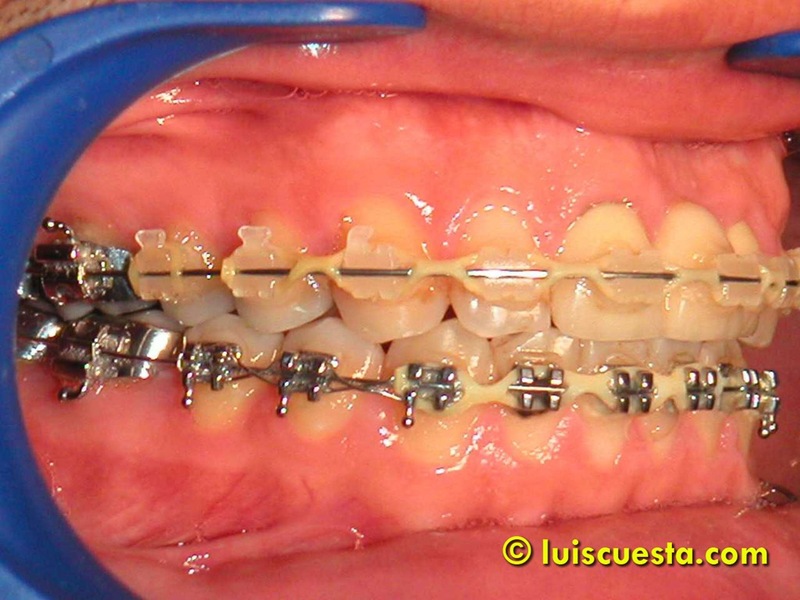 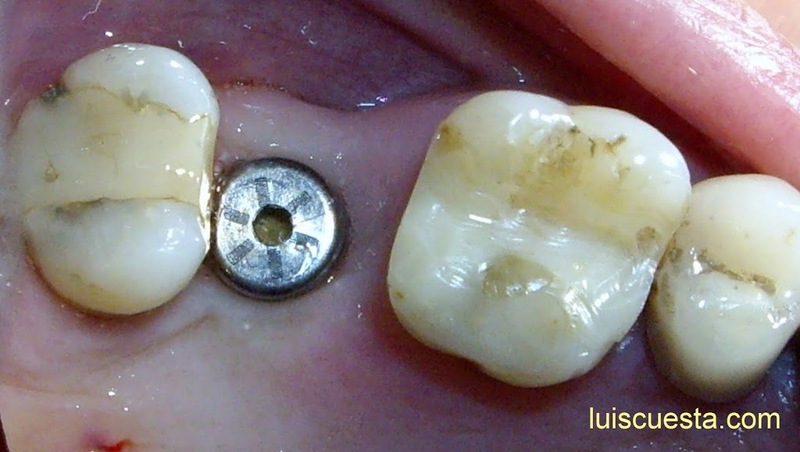 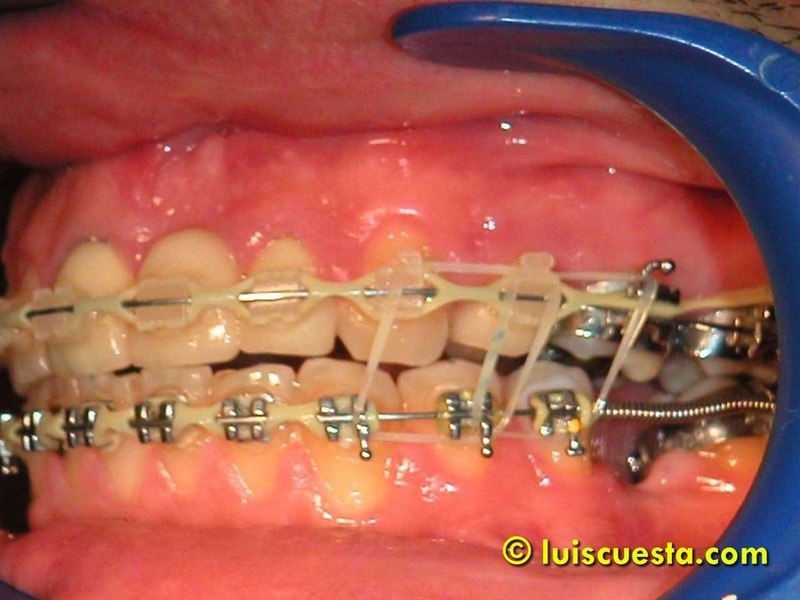 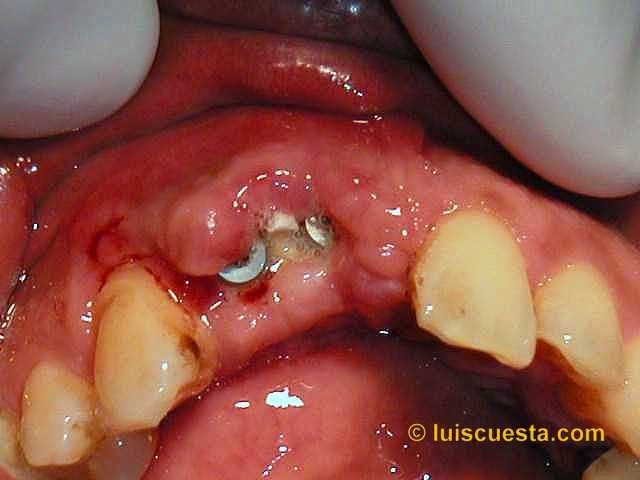 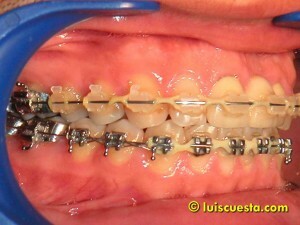 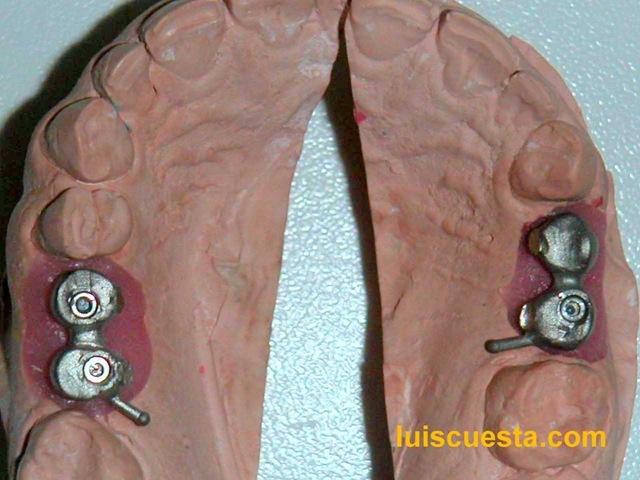 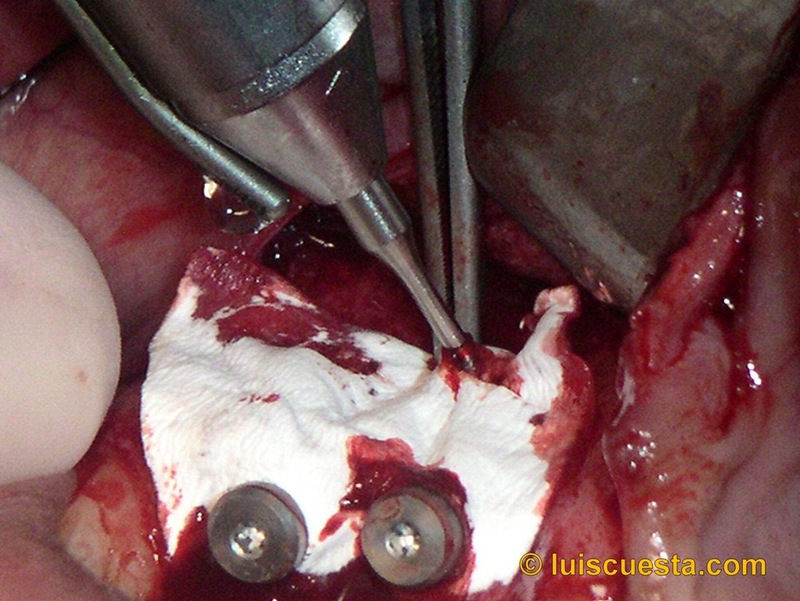 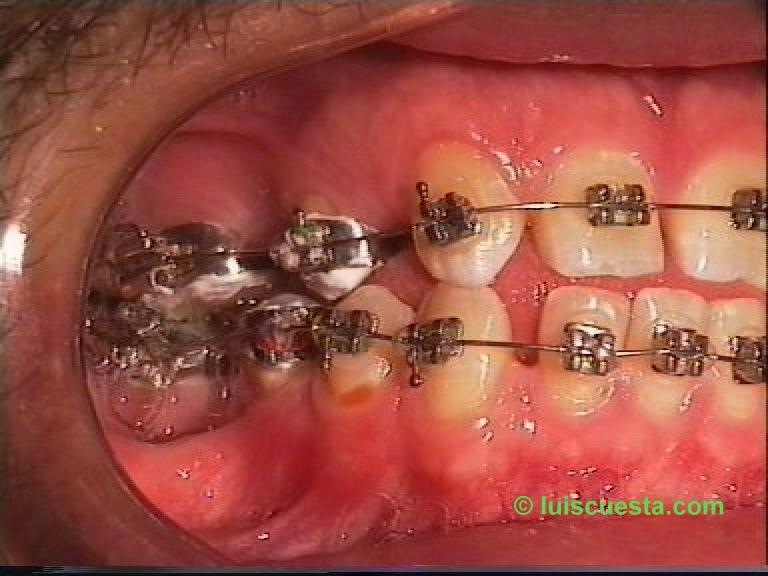 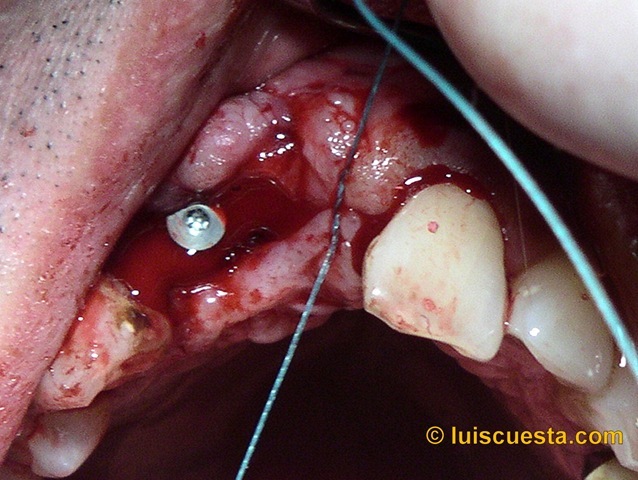 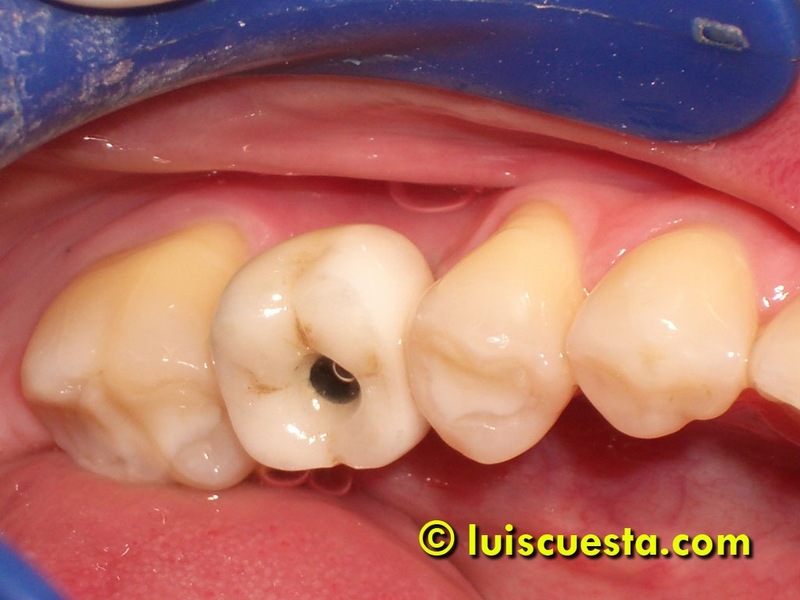 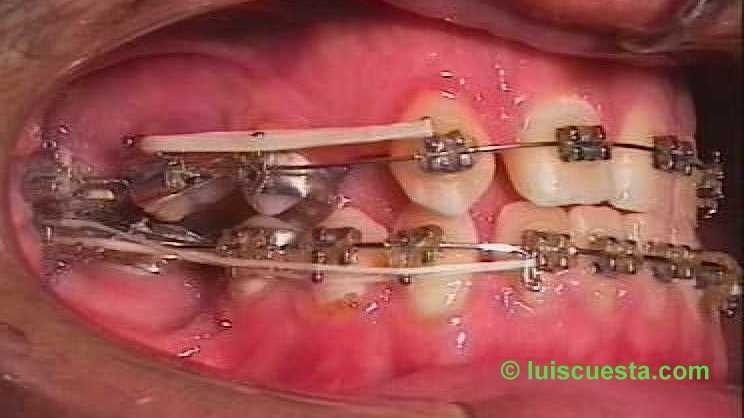 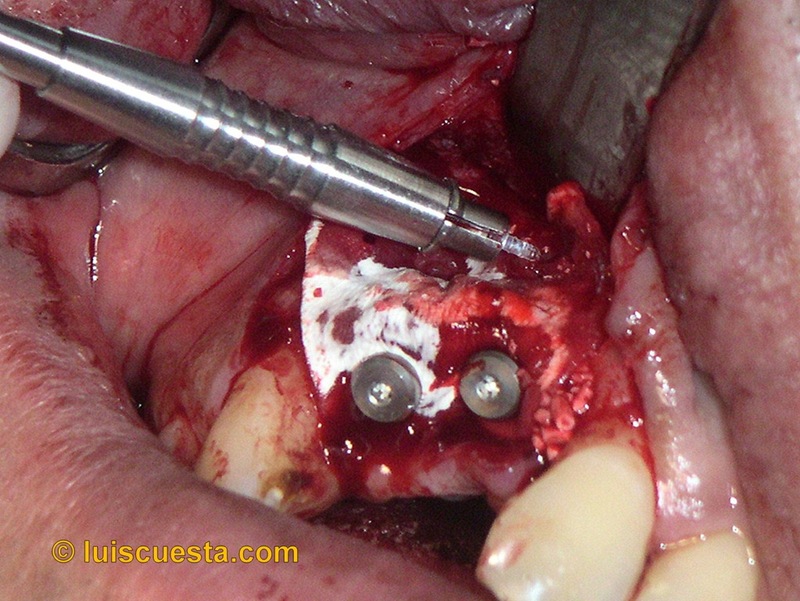 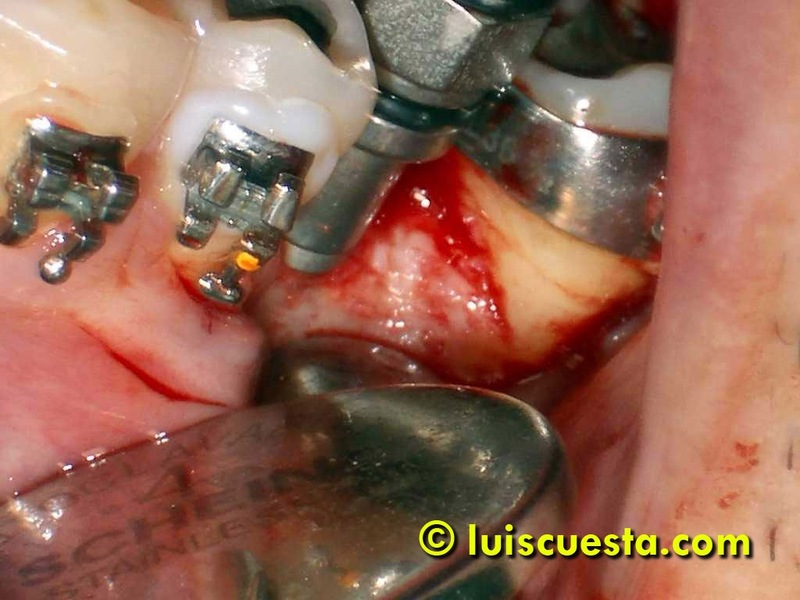 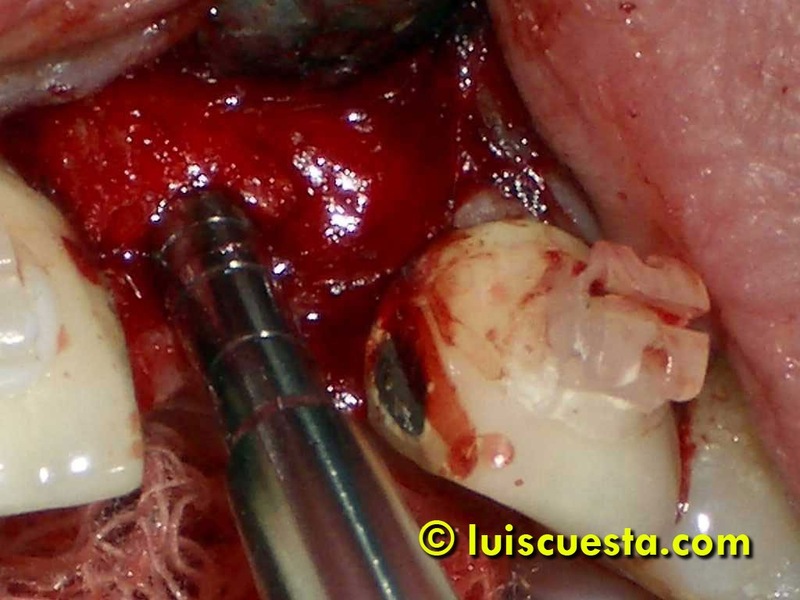 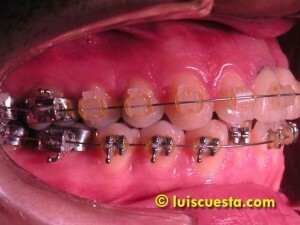 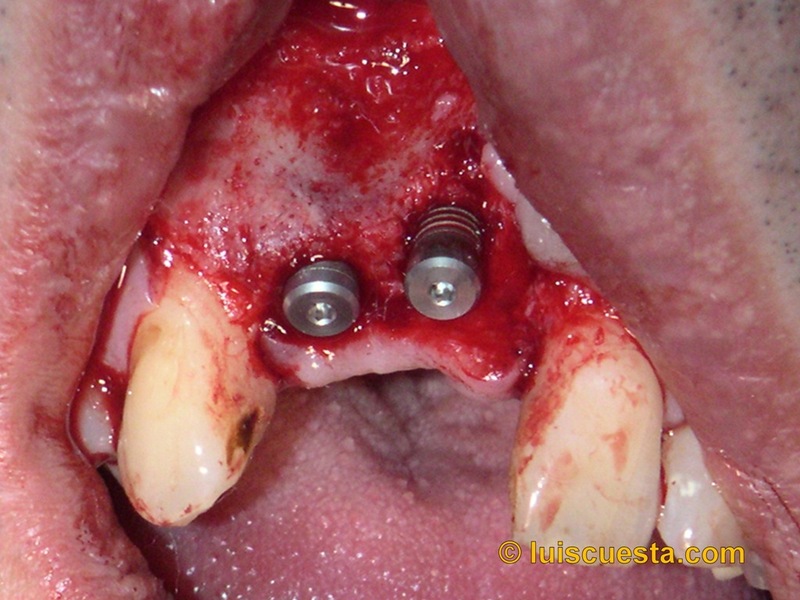 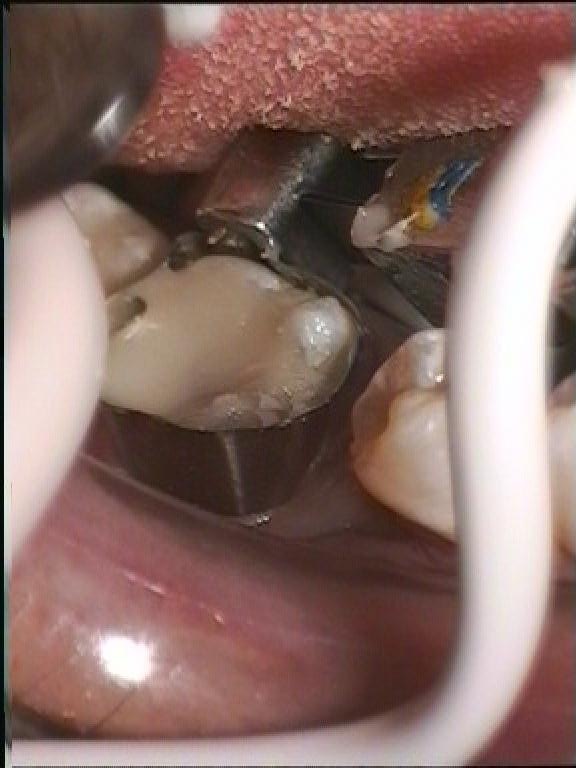 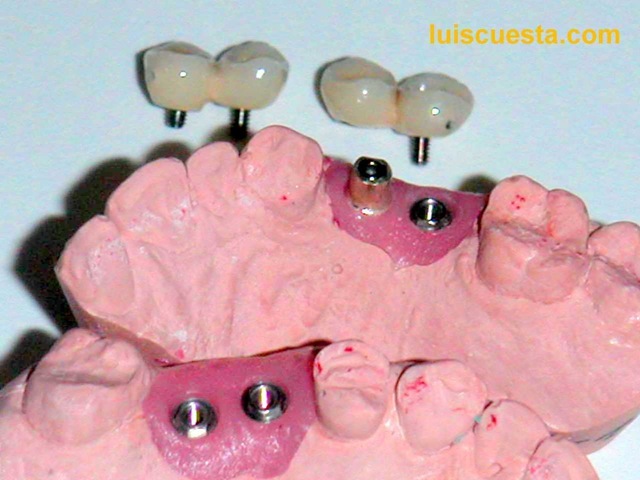 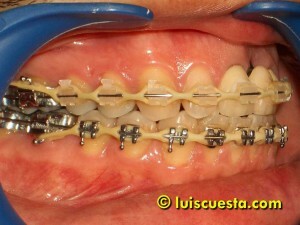 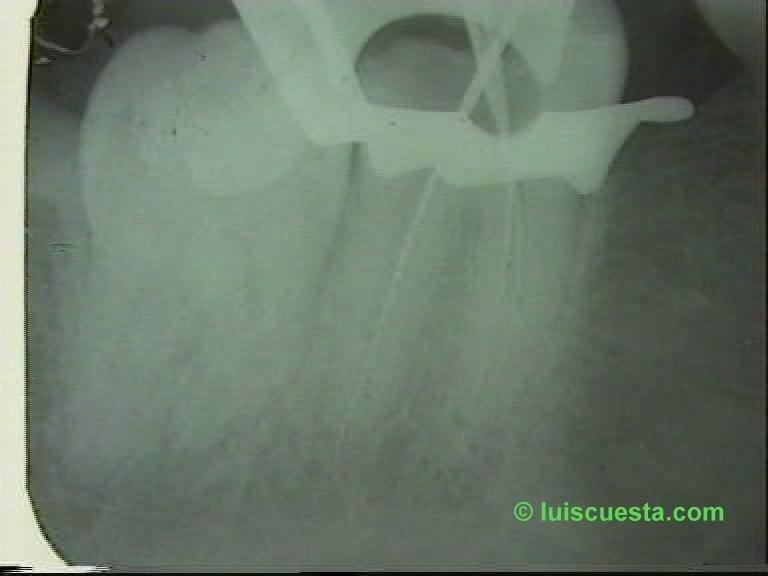 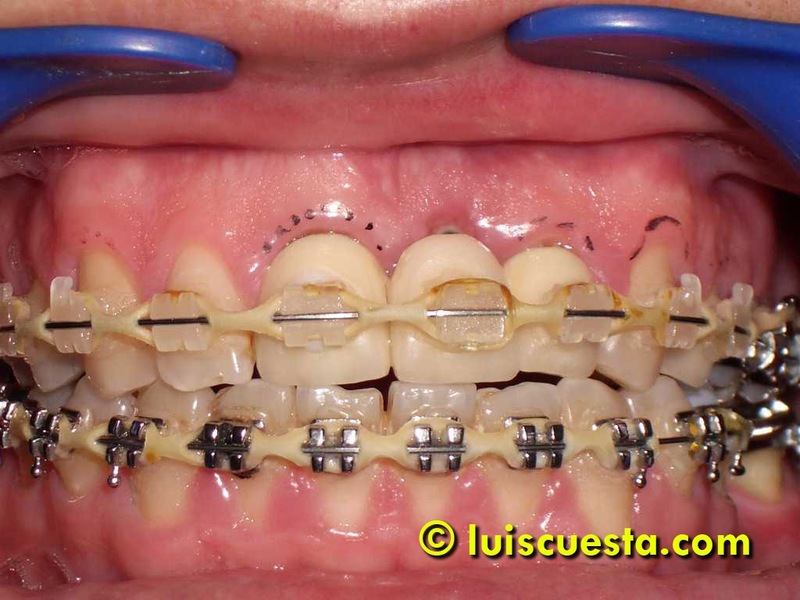 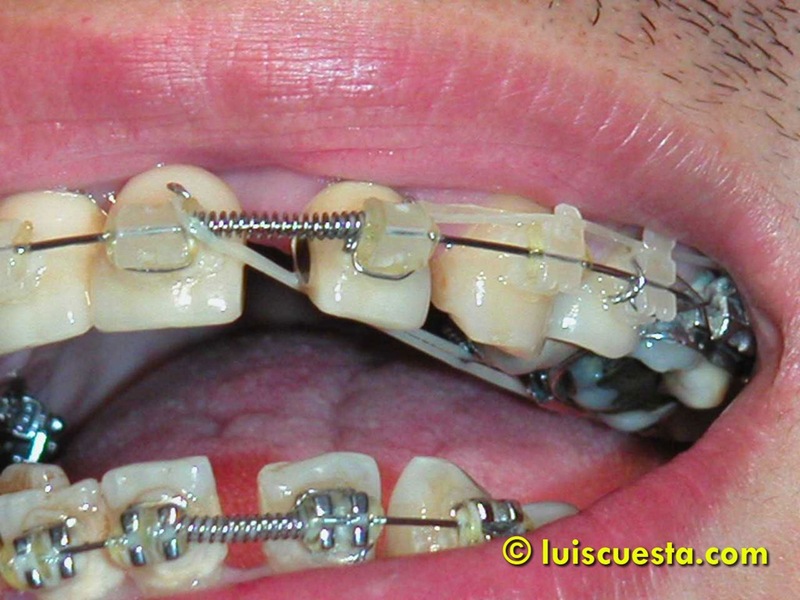 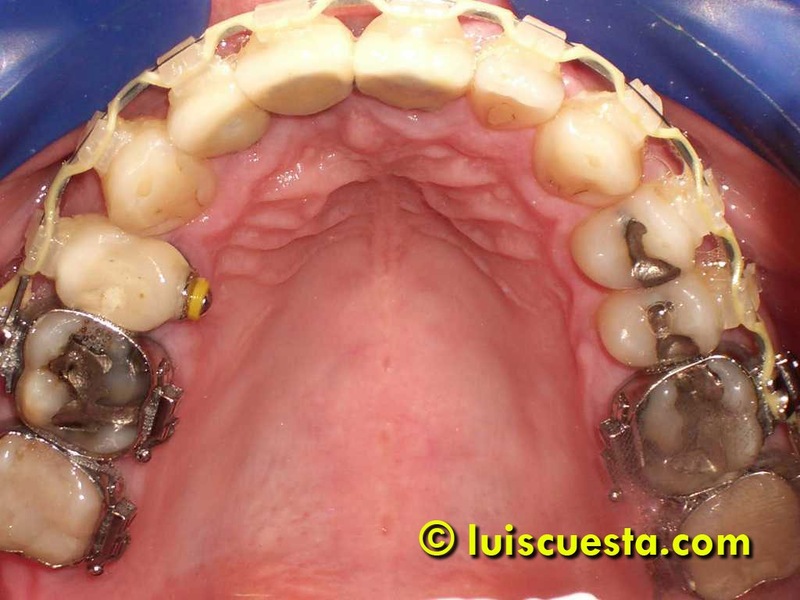 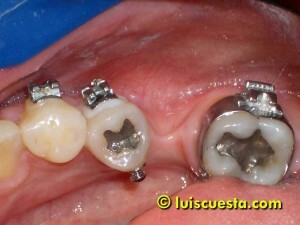 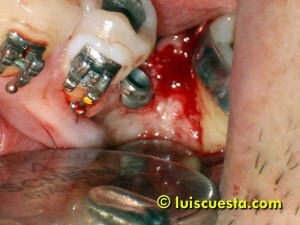 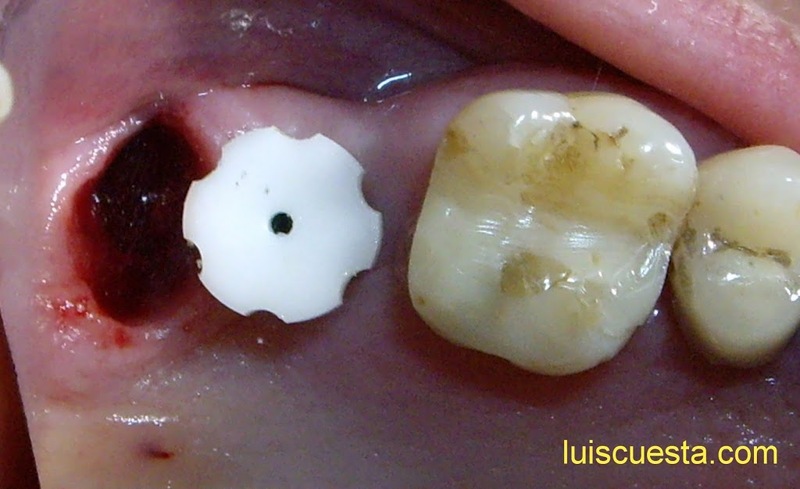 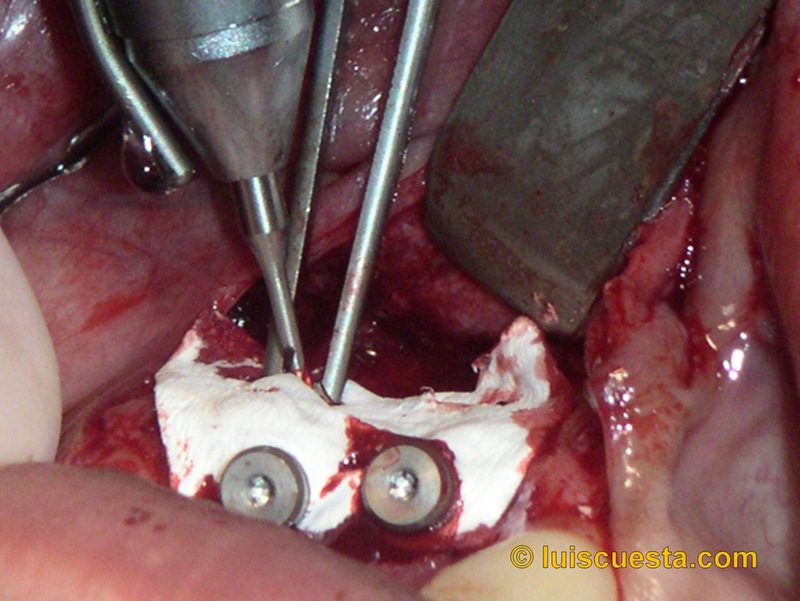 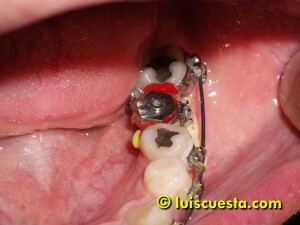 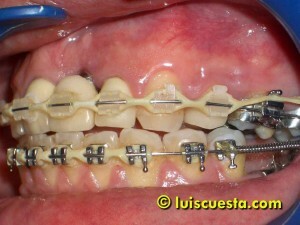 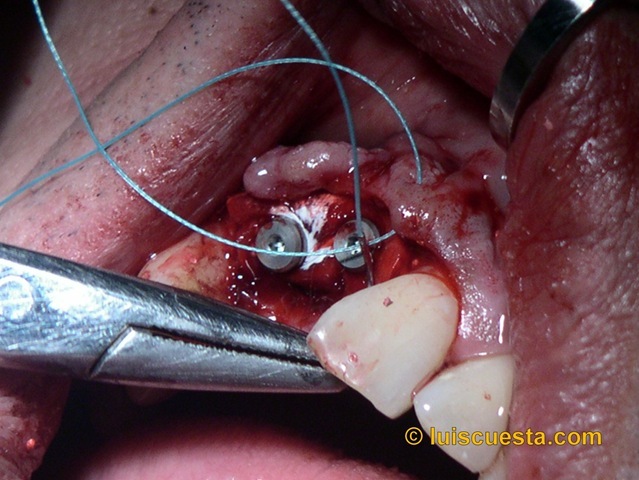 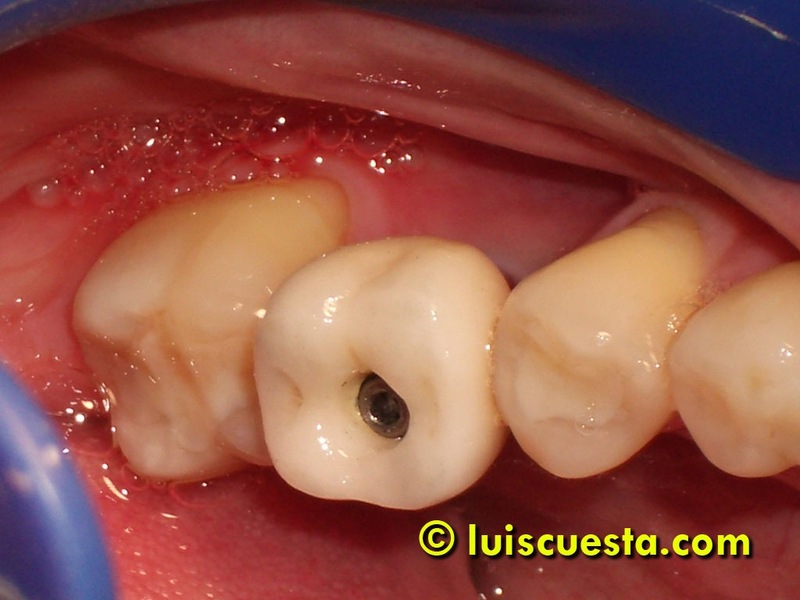 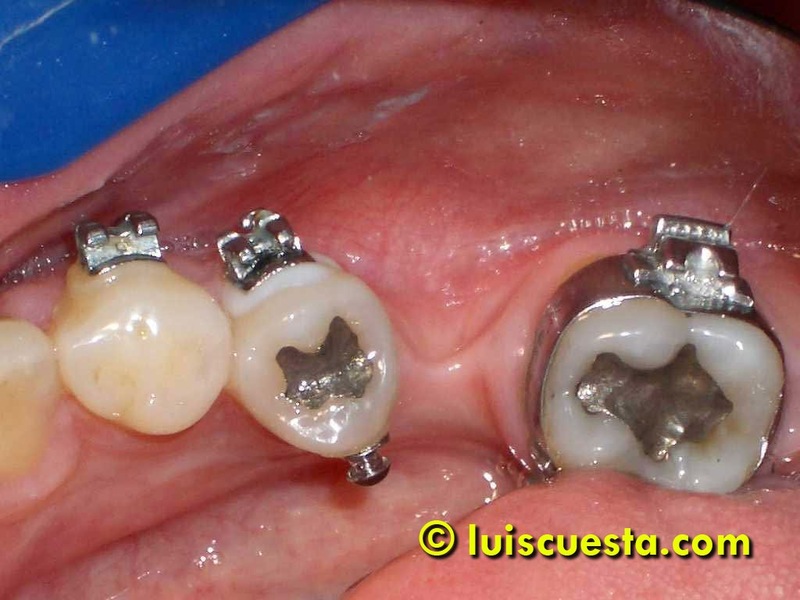 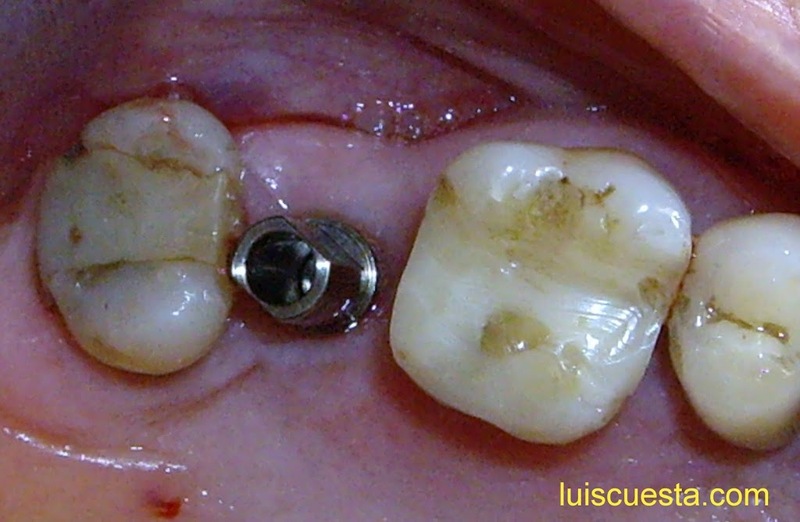 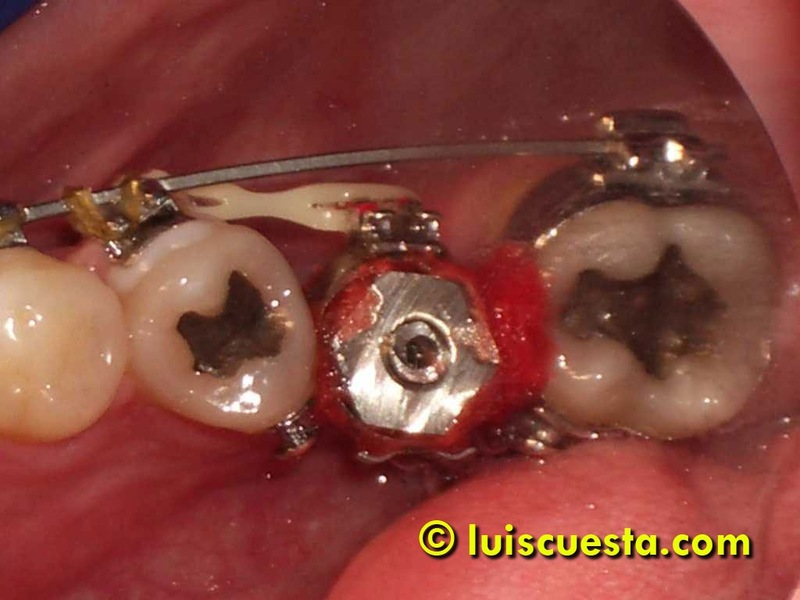 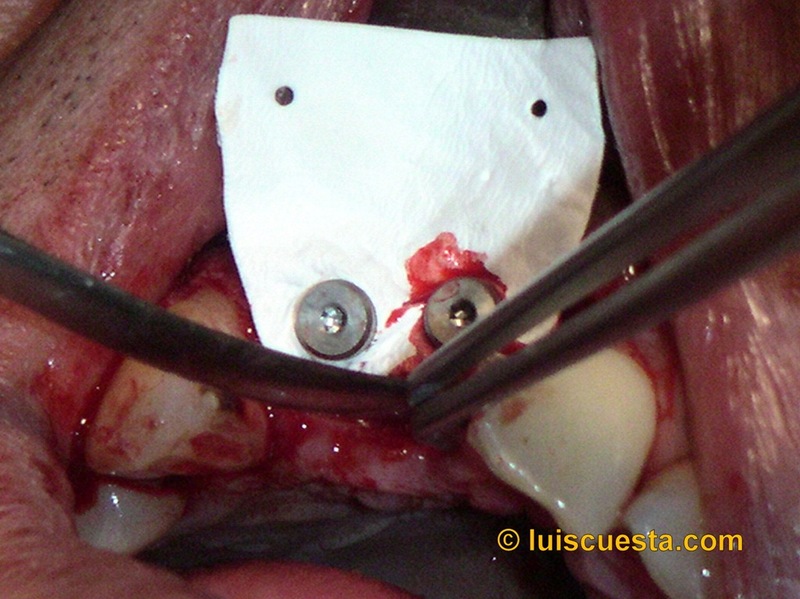 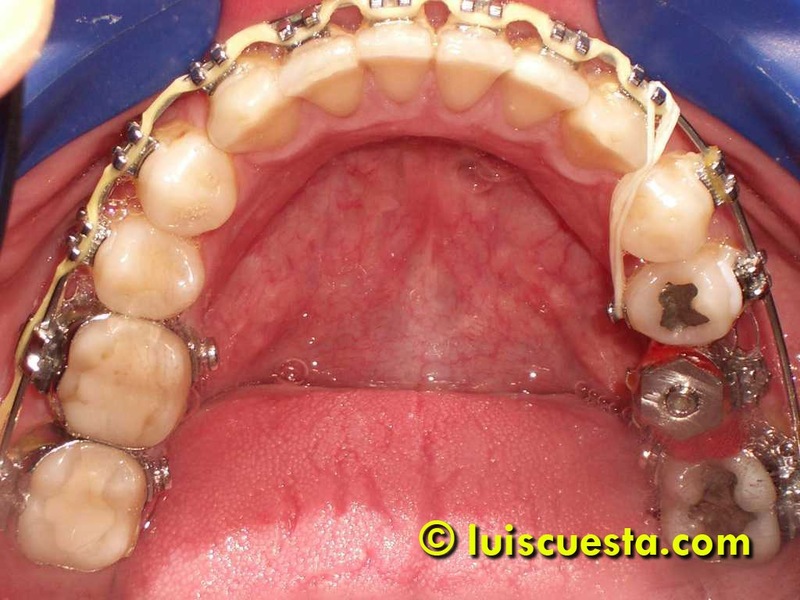 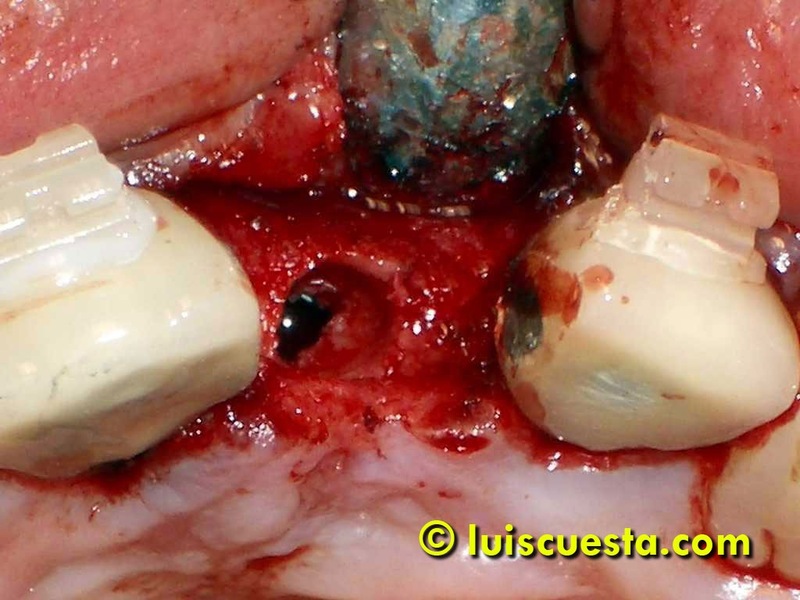 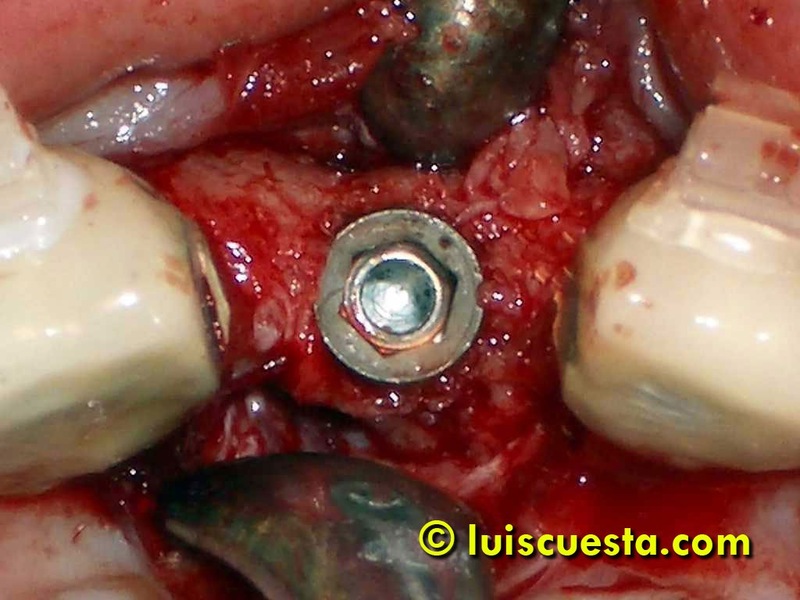 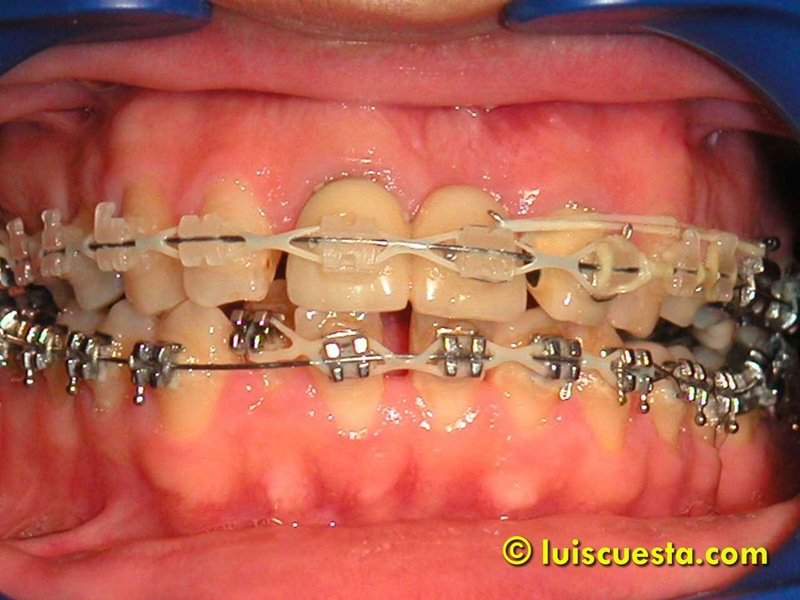 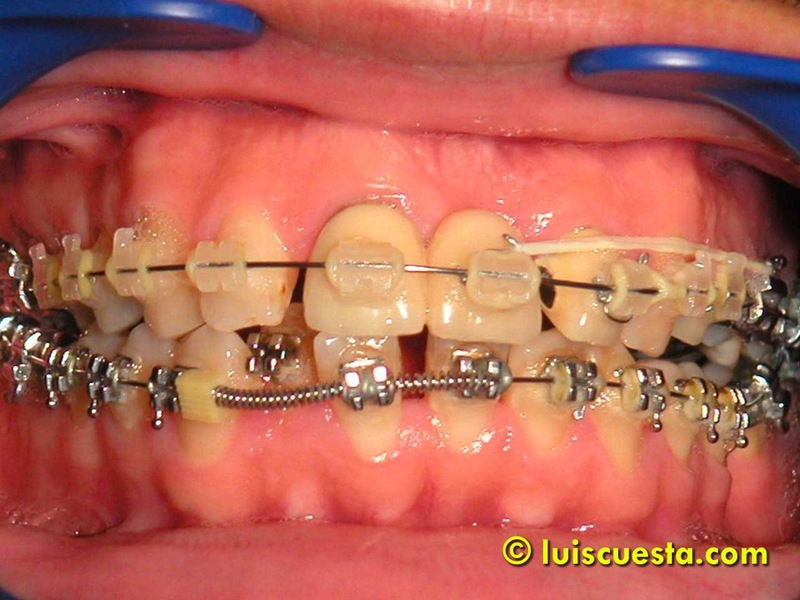 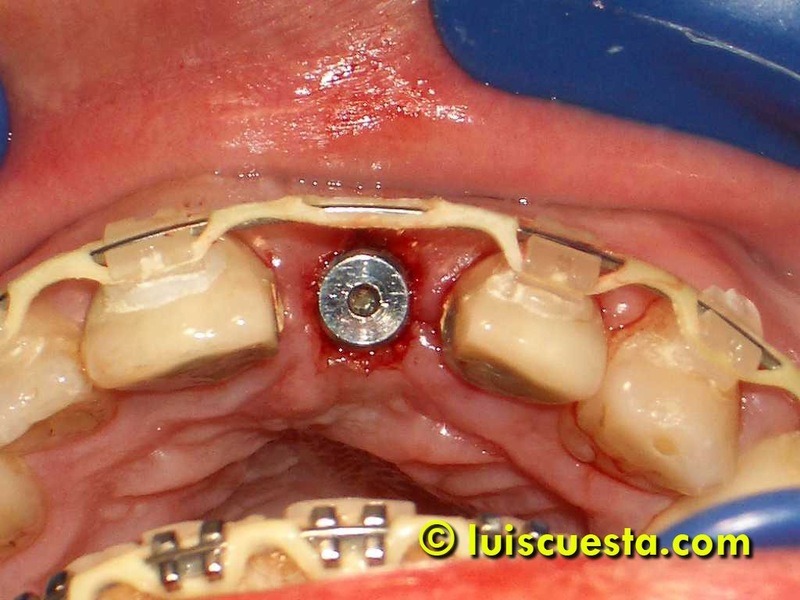 By changing the three ball retainers into Locator attachments and just placing the softer plastic rings under the metal matrixes, we achieved a good degree of confort for the patient. 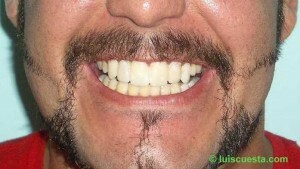 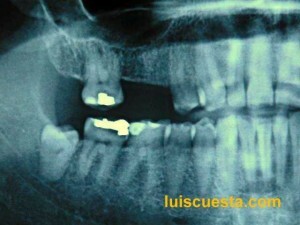 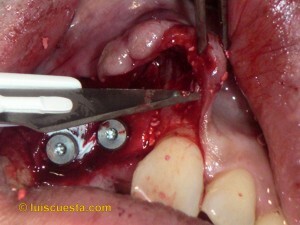 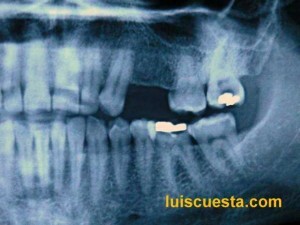 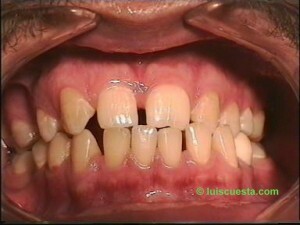 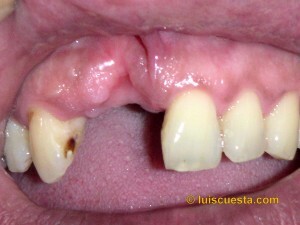 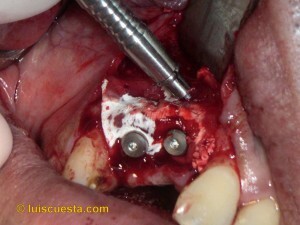 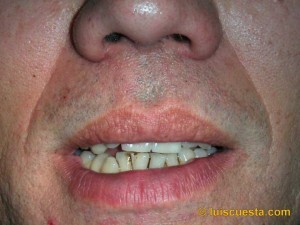 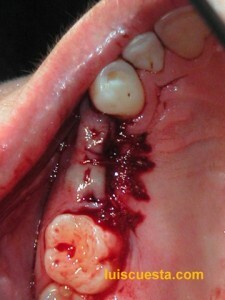 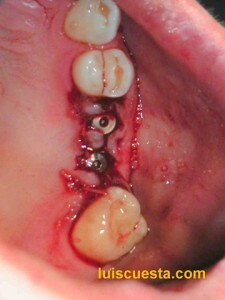 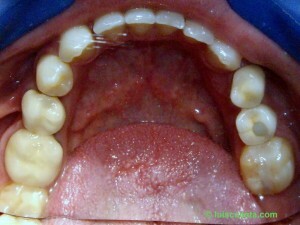 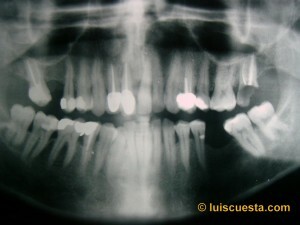 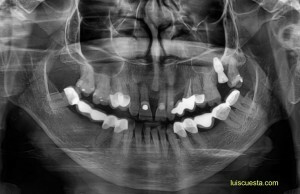 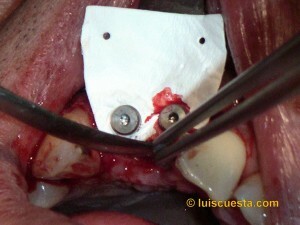 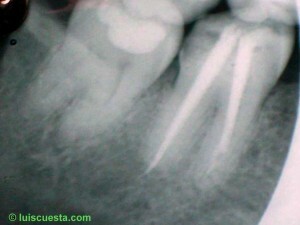 Day O: a second molar on the left upper jaw was extracted on May 9, 2011 due to a tooth fracture. 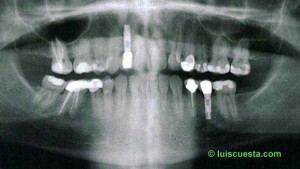 The X-ray was taken after the extraction. 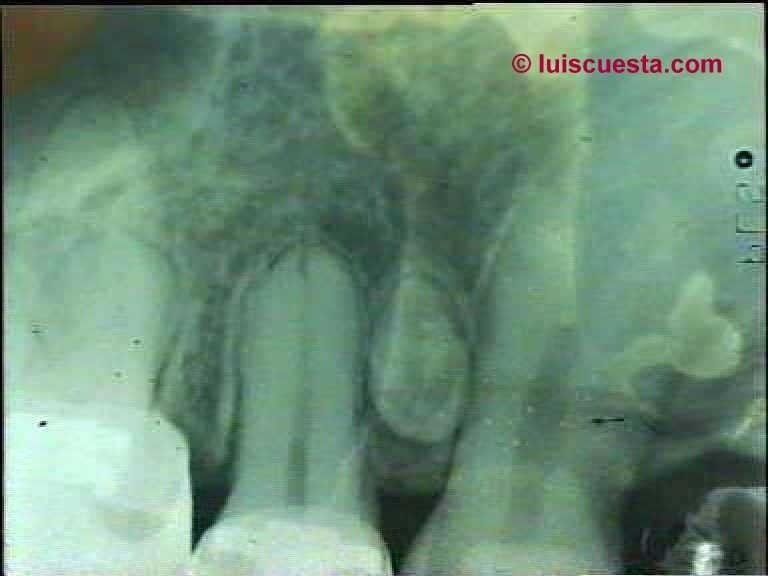 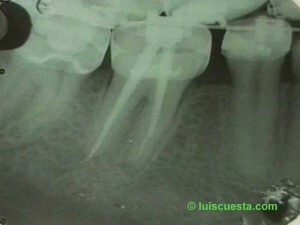 The wisdom tooth is kept behind to minimite the alveolar resortion. Three months later, on August 16, 2001 the ICX 4,8″x8″ was set with 35 N primary stability, by means of a punch technique and small vertical sinuslift, using a collagen membrane and autogenous bone. The implant was set further distal to the center space, counting already on the future extraction. The wund is sealed with a platform-switch healing screw. Two months later, on October 18, 2011, I make another X-ray check, test the stability of the implant.The bone has grown around the narrow neck threads. 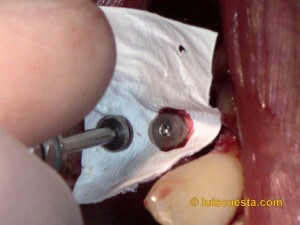 The bone is condensed around the apex and the impact sound is excellent, showing a good integration. I insert the closed-impression post. 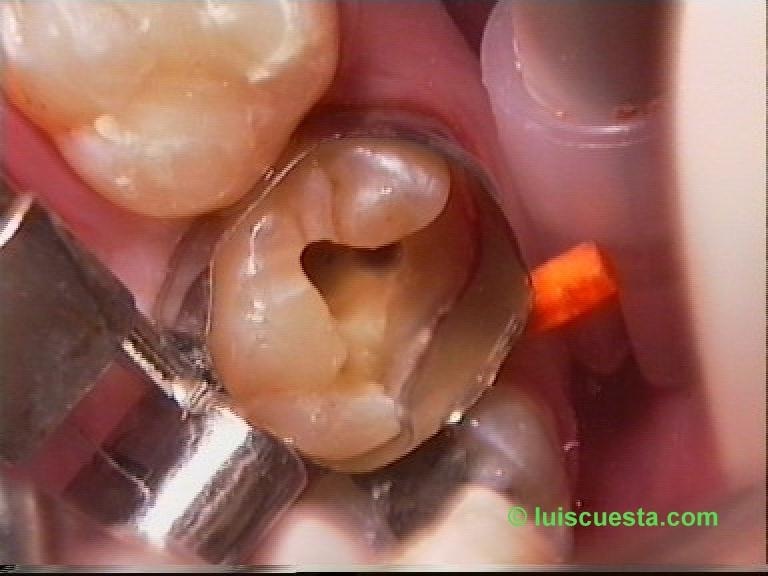 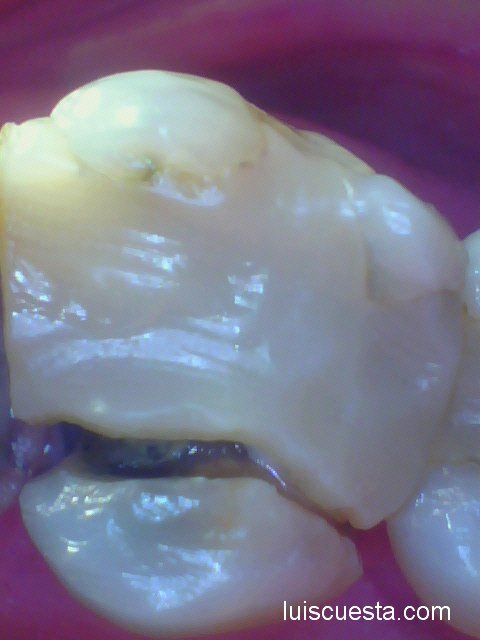 Now has come the moment of the extraction of the third molar (wisdom tooth), because it is no longer necessary and, furthermore, interferes with the plastic cap that goes over the post. 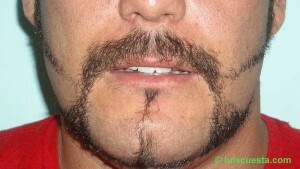 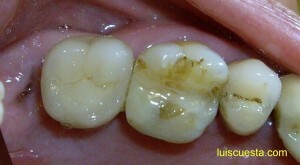 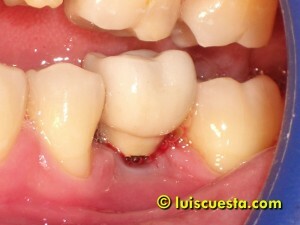 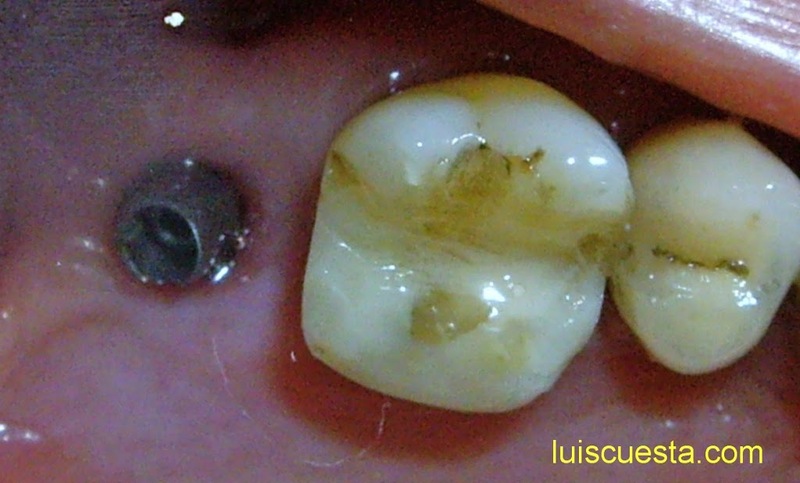 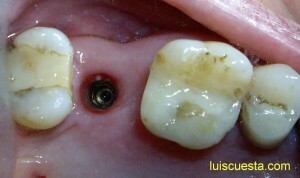 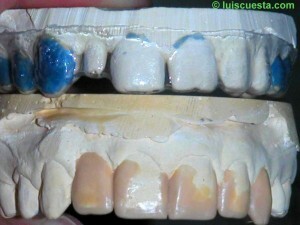 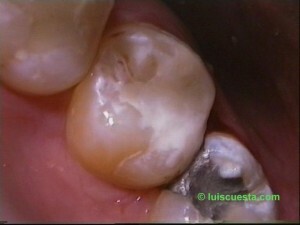 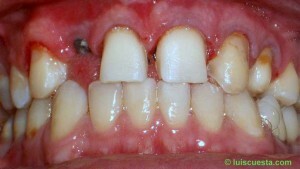 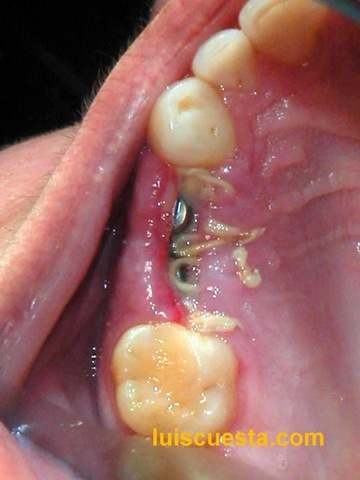 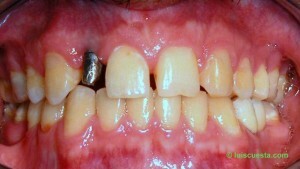 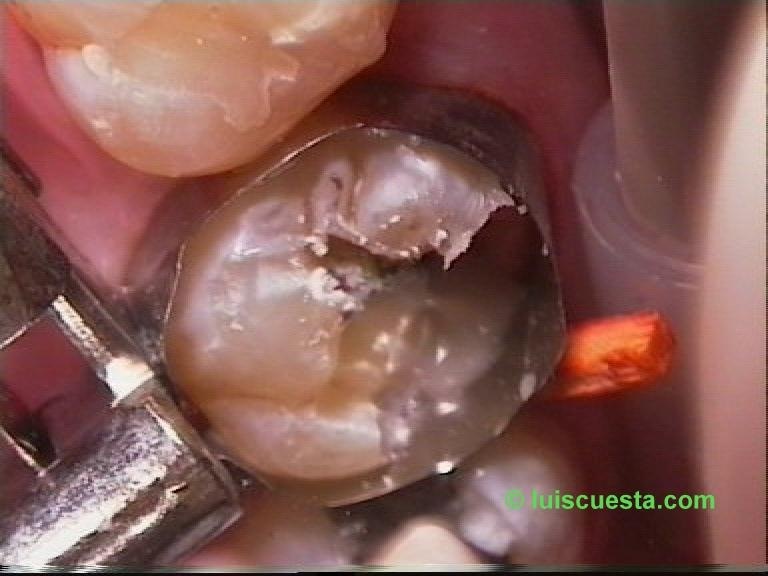 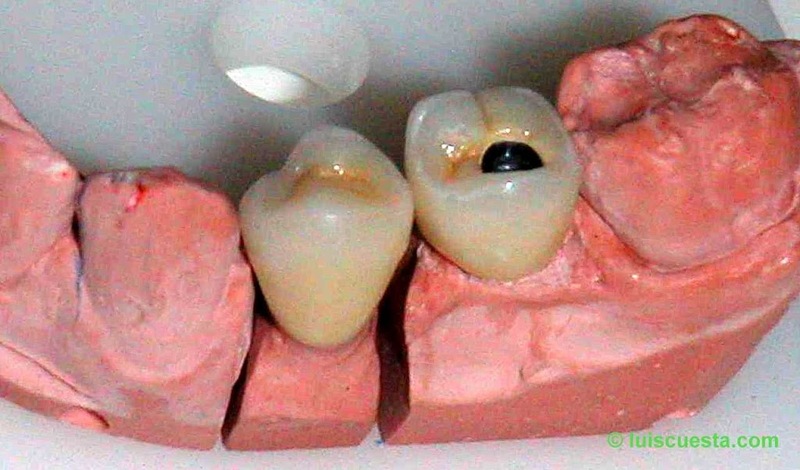 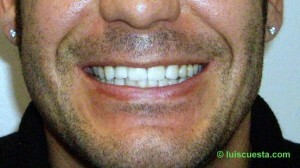 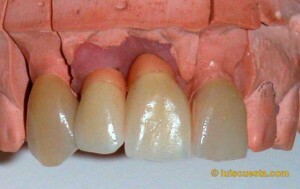 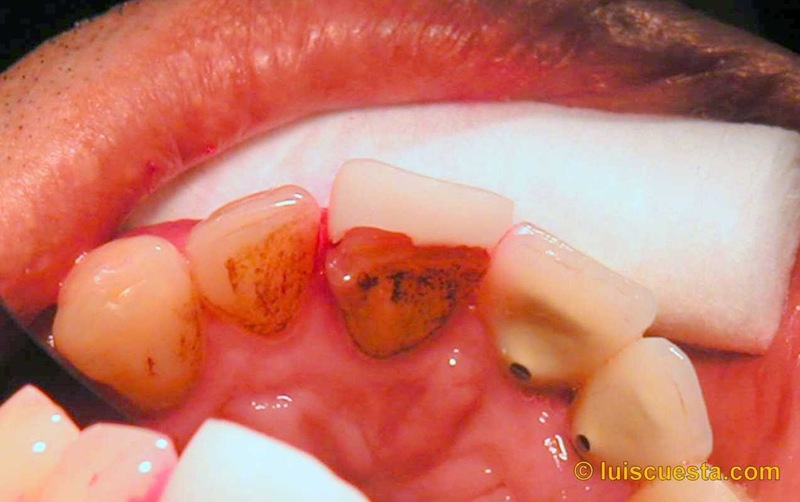 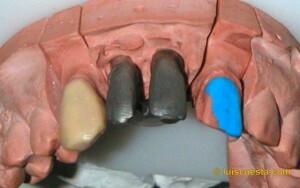 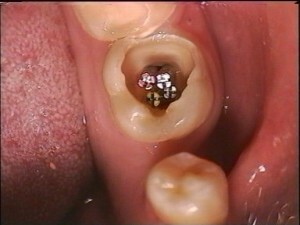 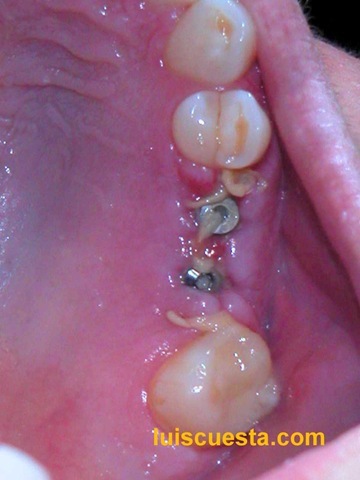 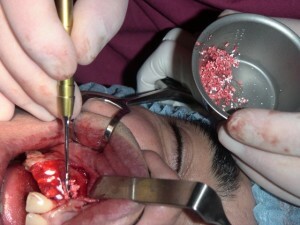 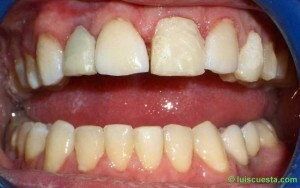 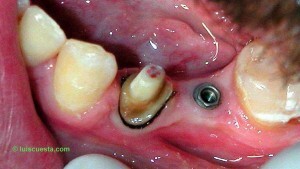 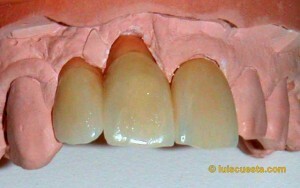 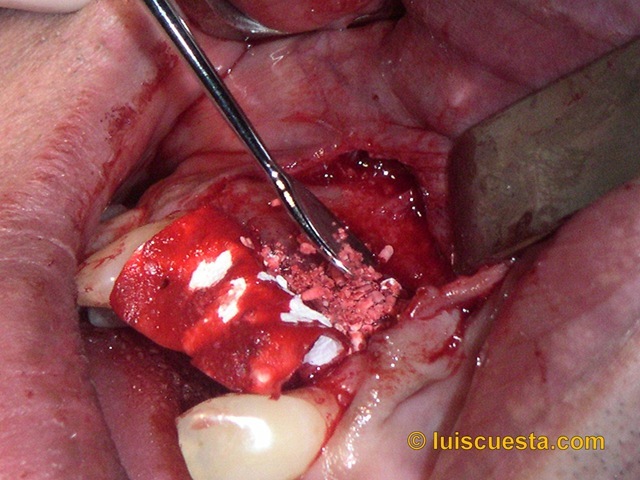 The impression is taken therefore after the extraction. Nine days later, on October 27, 2011, the abutment is screwed in with 35 N torque and the crown is cemented with temporary cement until the 6-moth control. 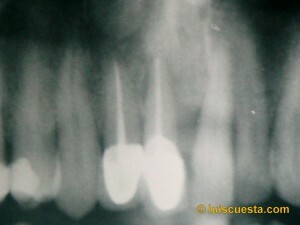 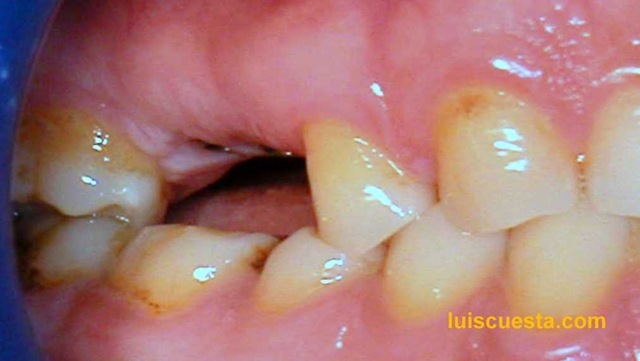 Maxillary bicuspids on both sides. 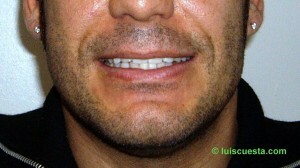 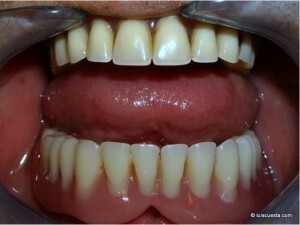 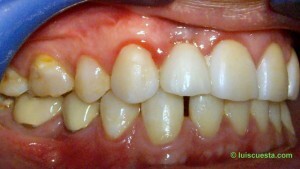 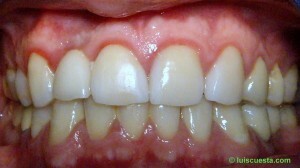 Esthetic treatment with four implants. 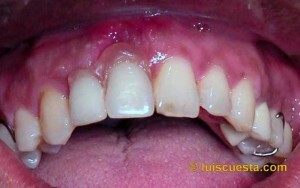 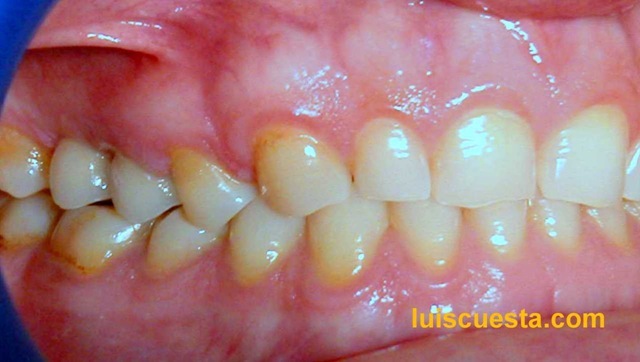 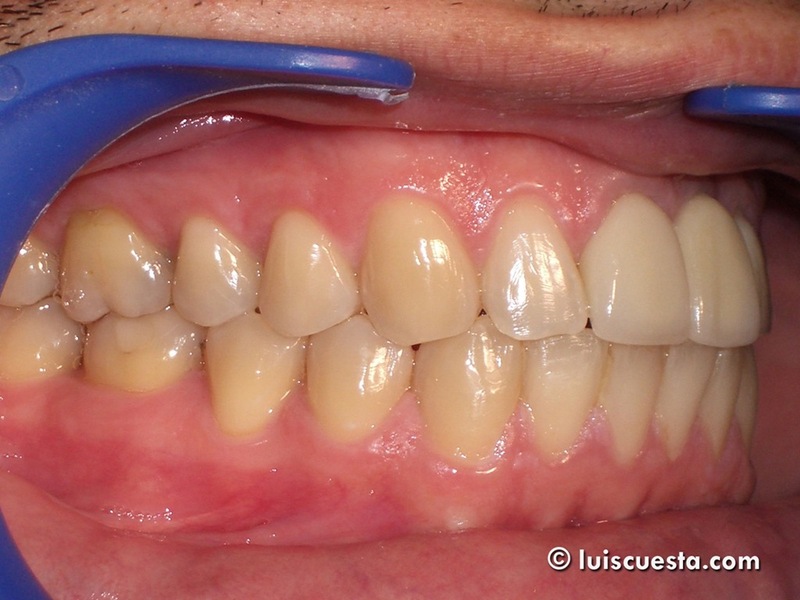 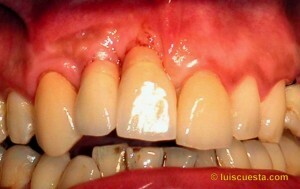 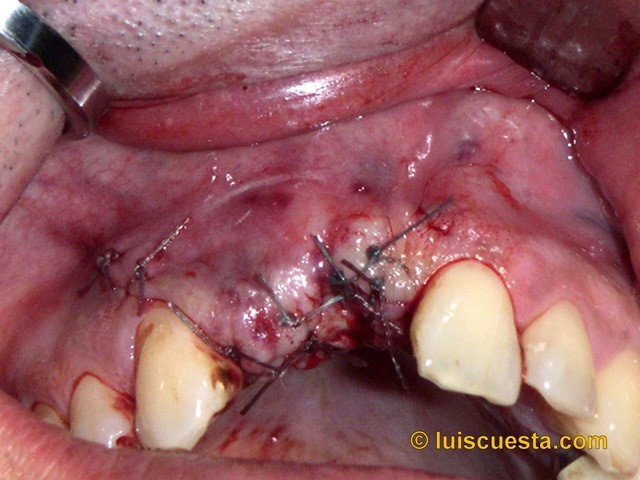 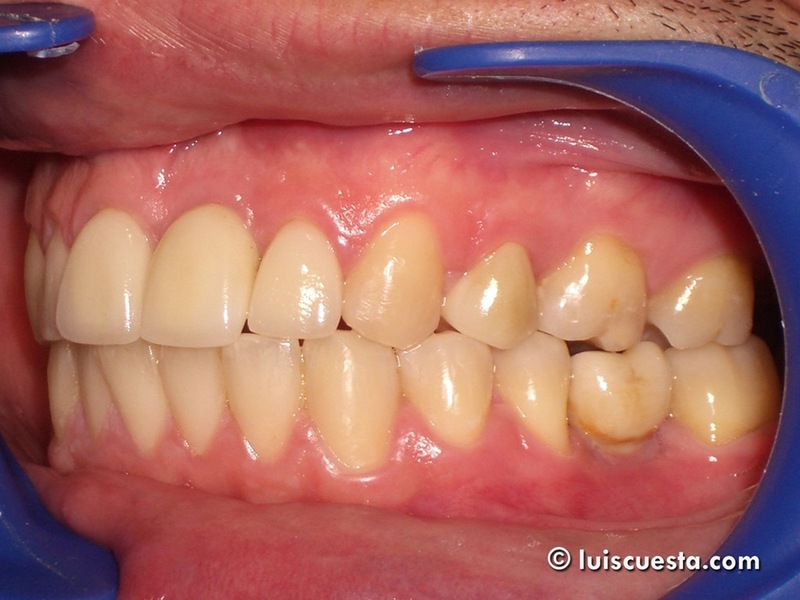 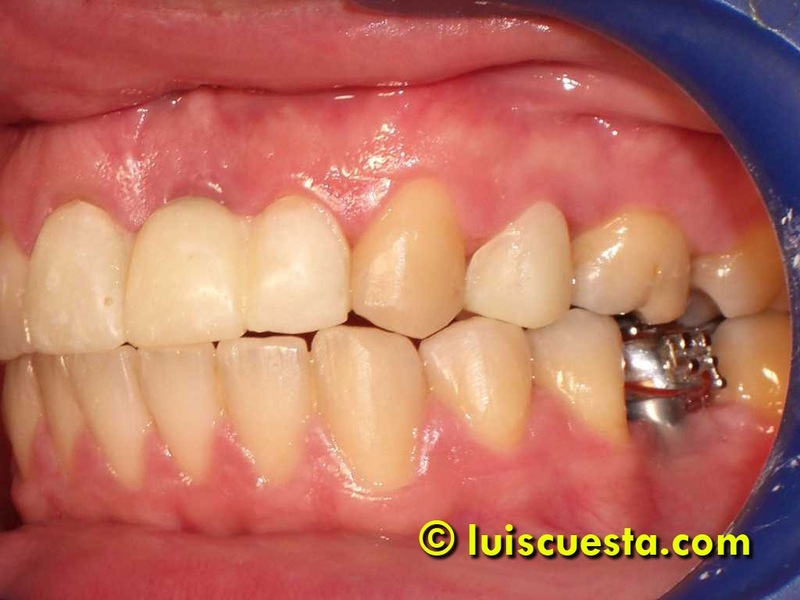 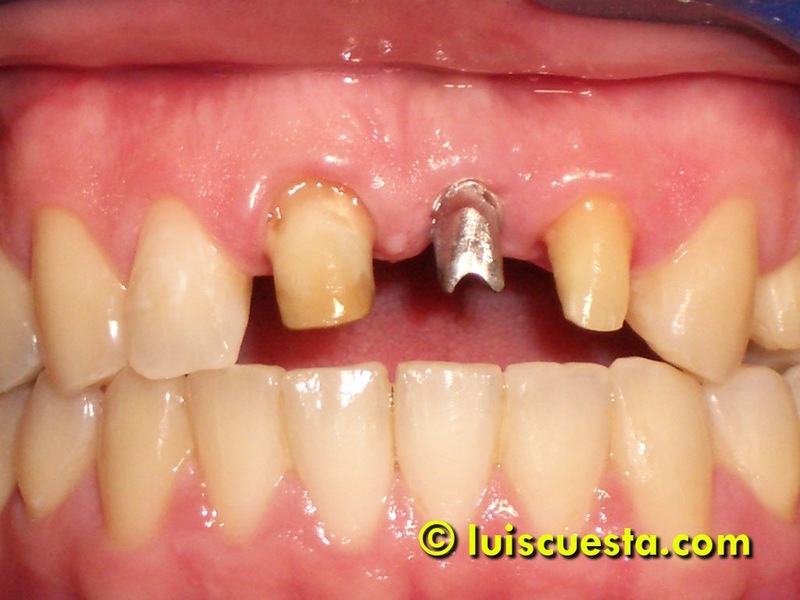 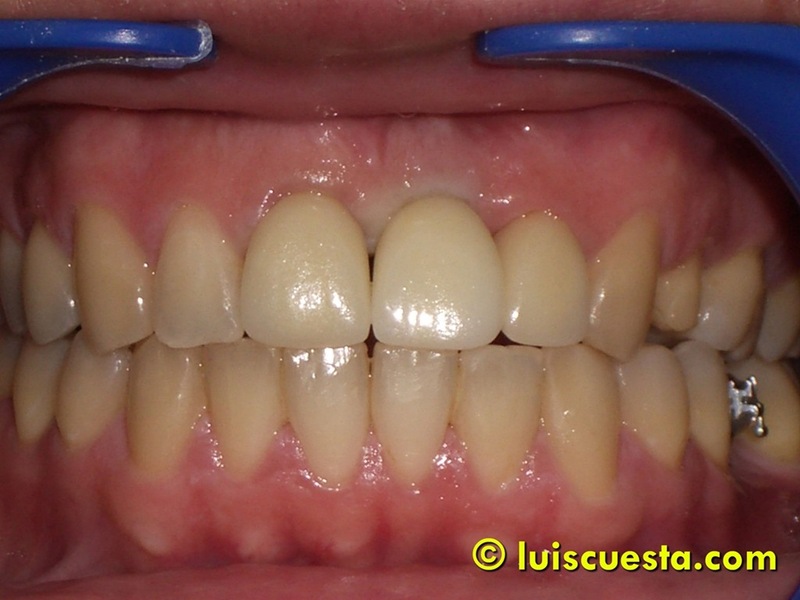 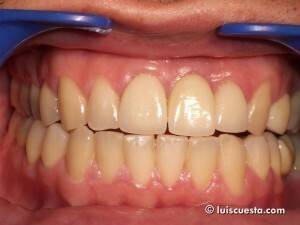 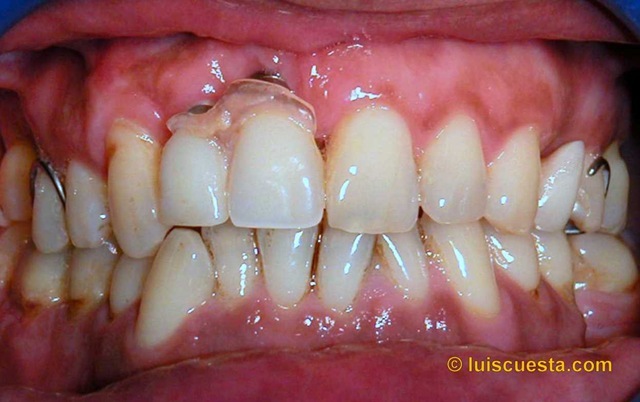 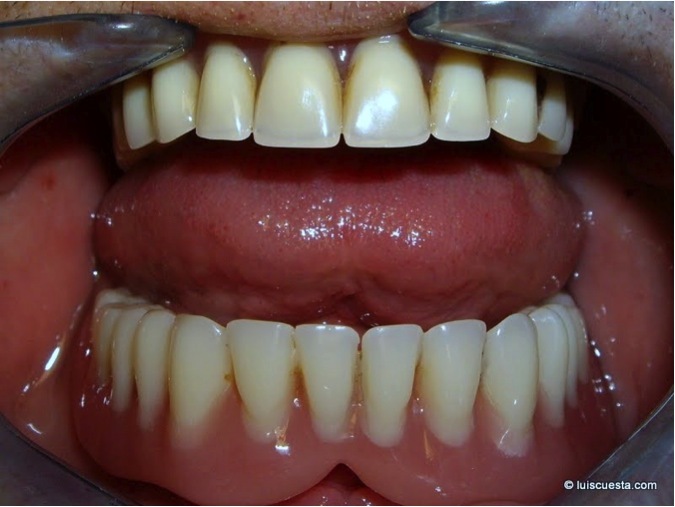 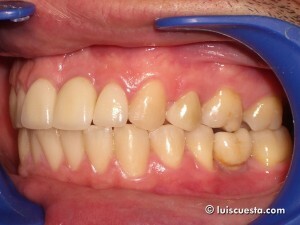 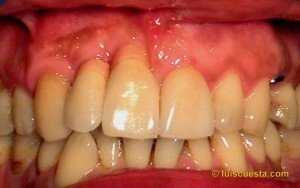 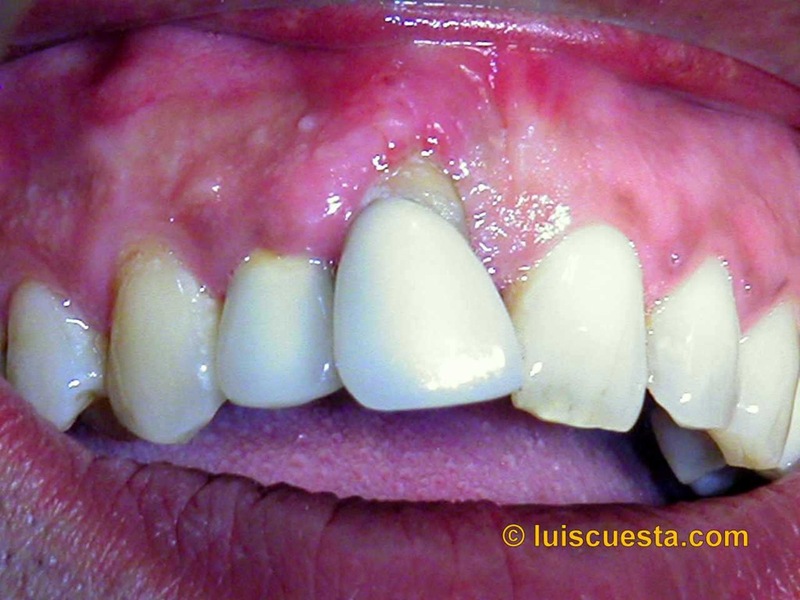 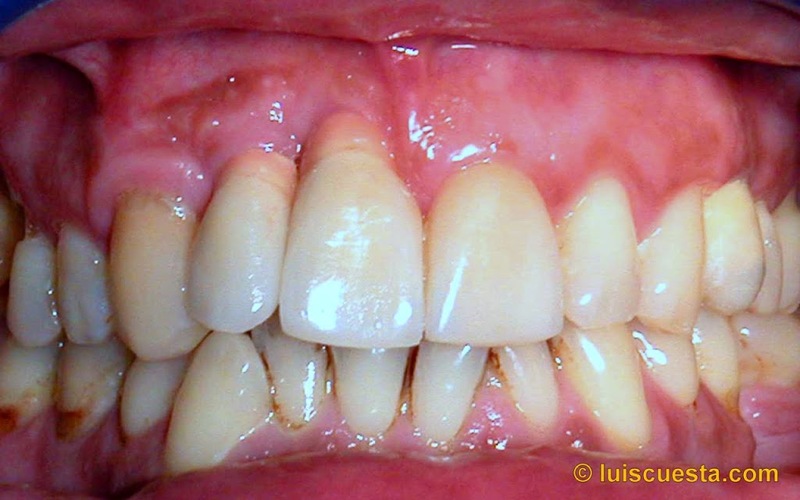 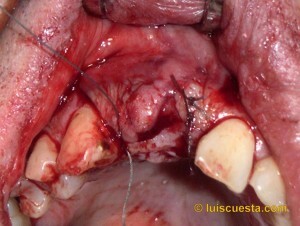 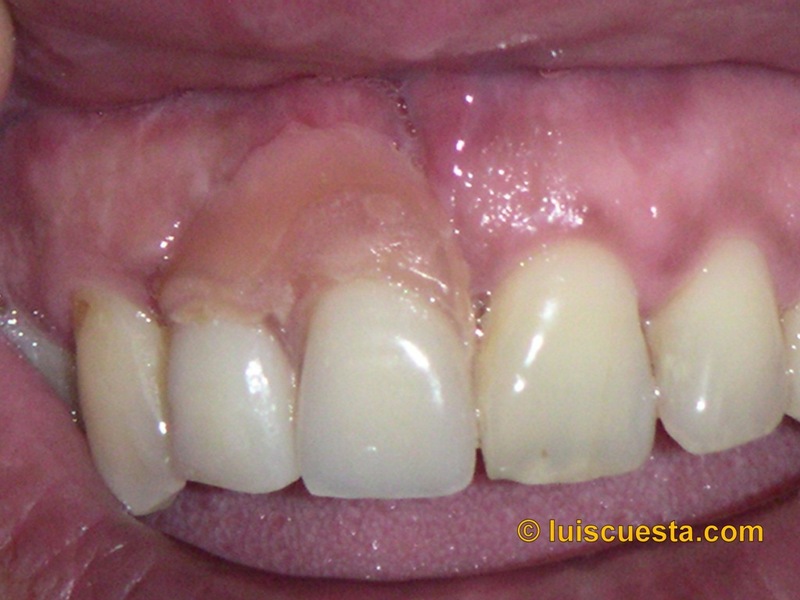 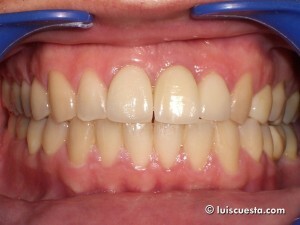 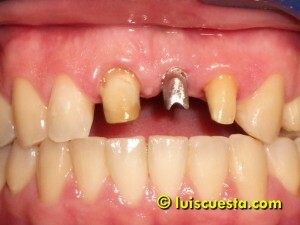 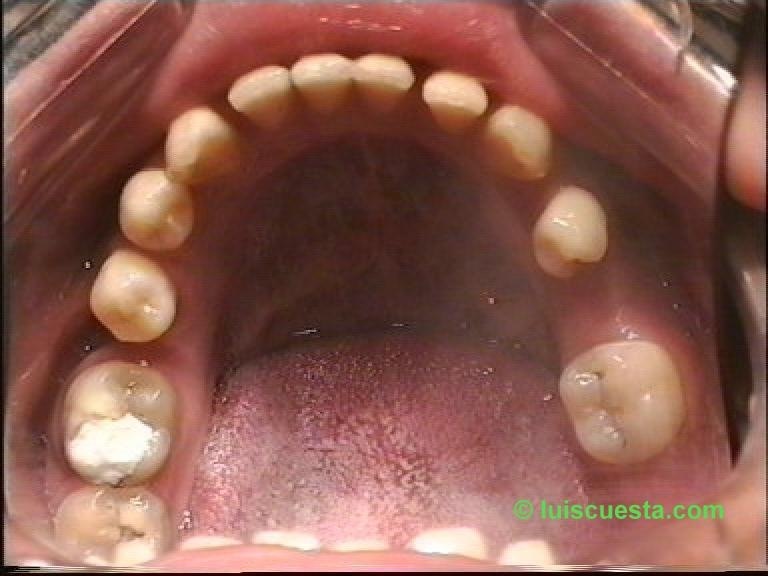 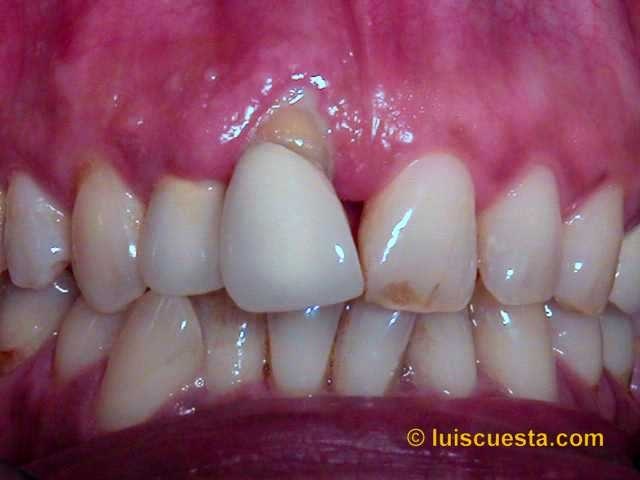 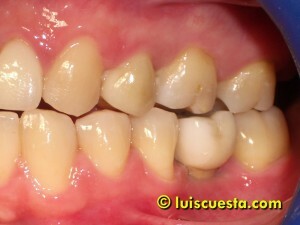 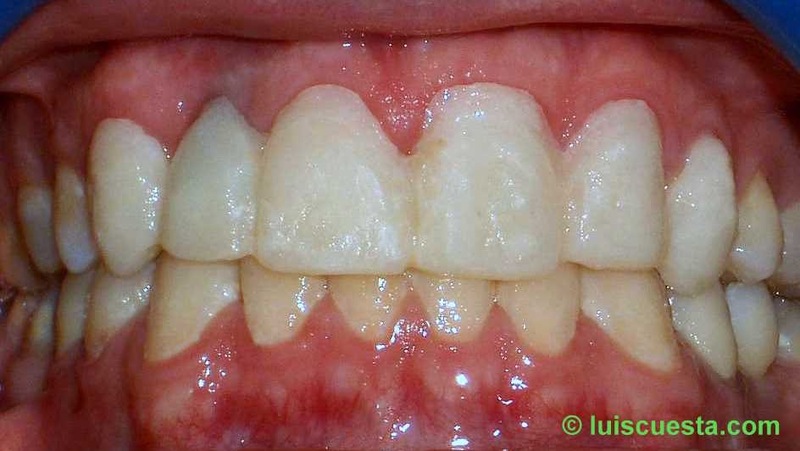 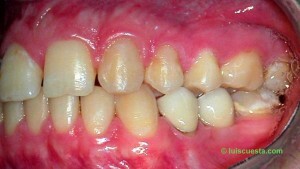 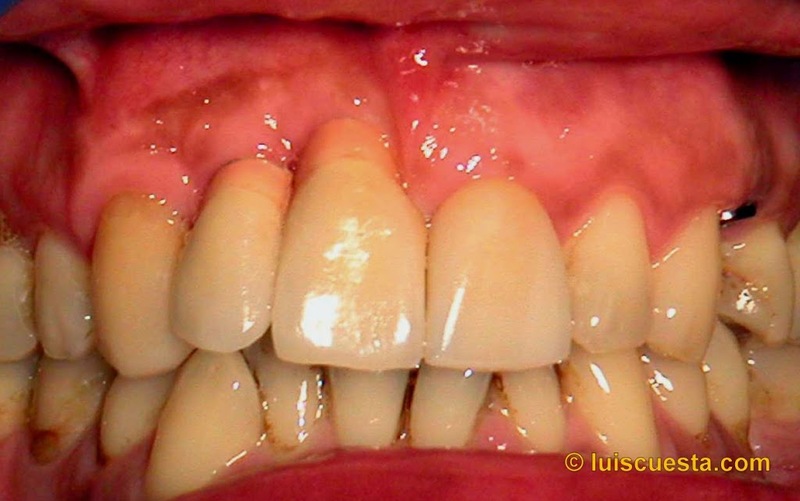 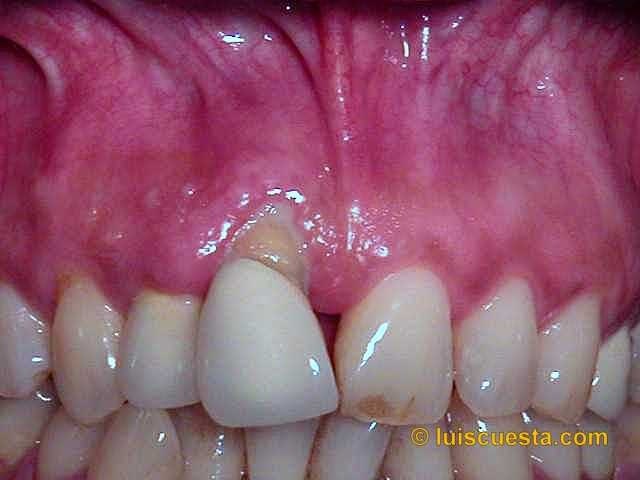 This is a simple case with plenty of bone, plenty of attached gingiva and quite good prosthetic space. So we might as well expect some esthetic results. 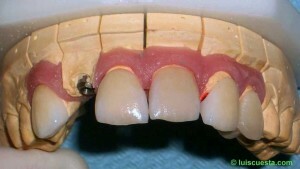 However, it’s interesting to notice the difference in healing following the two different techniques chosen while stitching the flaps back in place. On the right side I simply faced both parts of the wound and sewed them up with simple and double stitches. 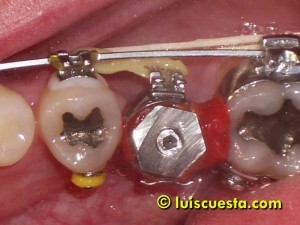 The picture sequence is as of 0, 5 and 22 day period. 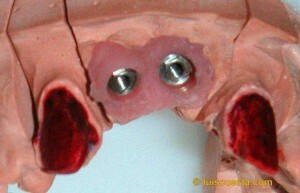 On the left side I removed part of the gum prior to sewing both ends in place, letting the screws exposed. 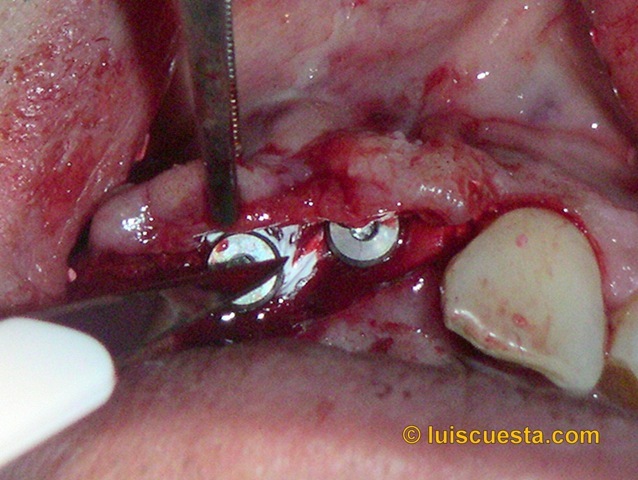 The healing, as we can see, is apparently healthier, no second surgery was needed to expose the healing screws, but the final result was the same on both sides. 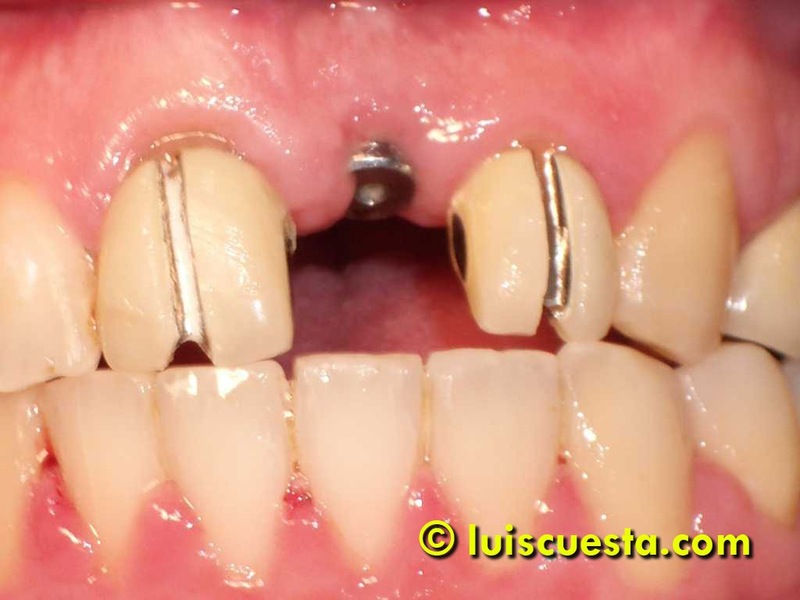 Basically, because the attached gingiva was generous on both, the gum biotype was thick and there was no need to lift up the flaps during surgery, as the bone was wide enough, too. 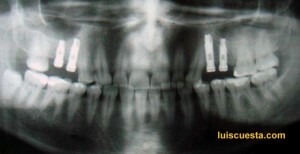 These are the radiographic details. 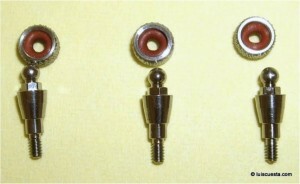 External hexagon 3.75 x13 and 10mm, . 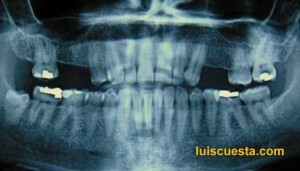 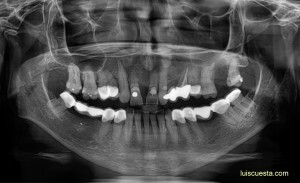 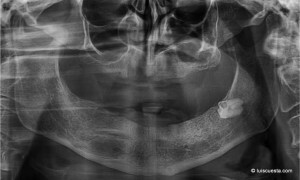 Front implant overlapped radiographically due to the pantomographic angle of exposure. 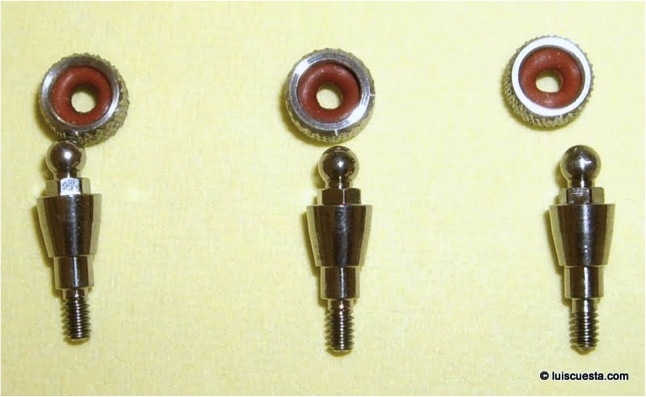 All except for the stump on 24, are screwed. 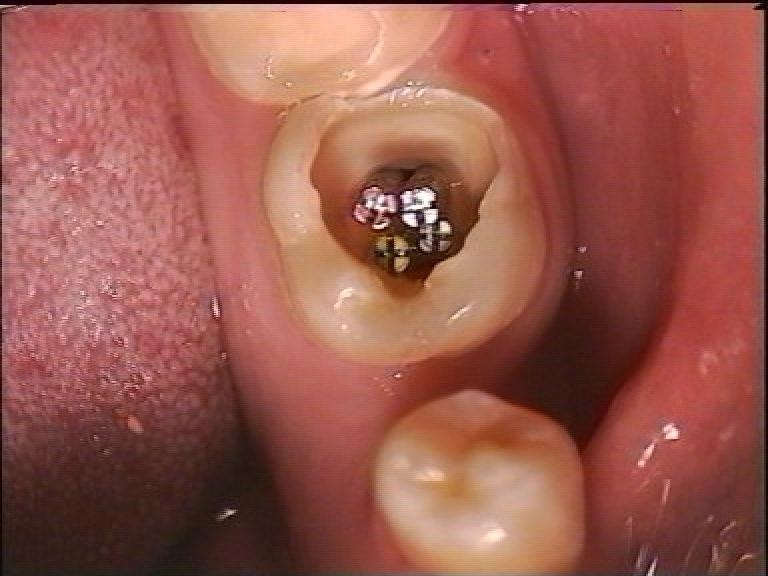 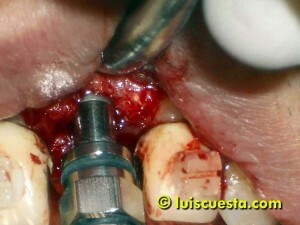 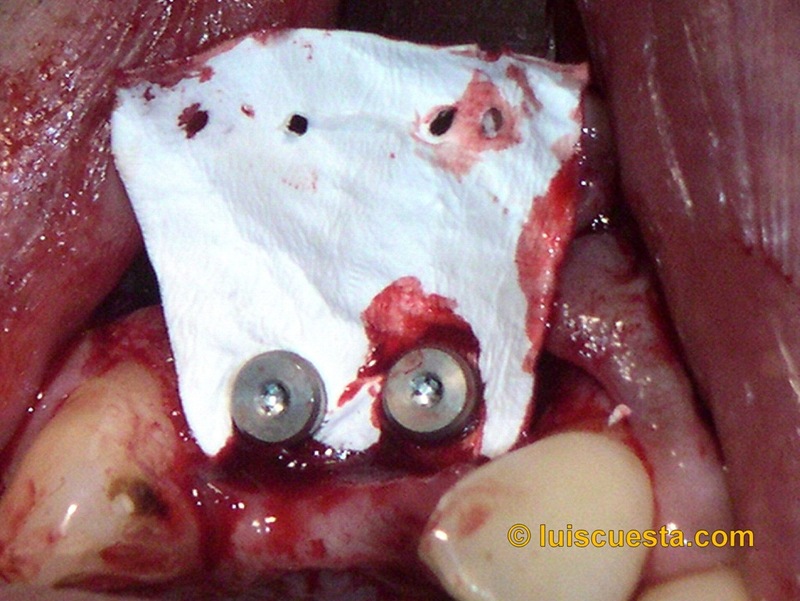 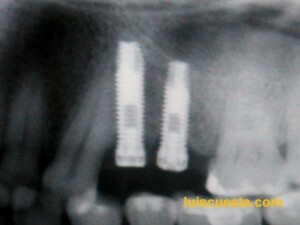 24 was done on stump because the intermaxillary gap was short. 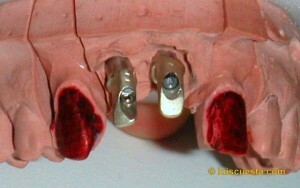 The antagonist 35 was also reduced in height, as you may see. 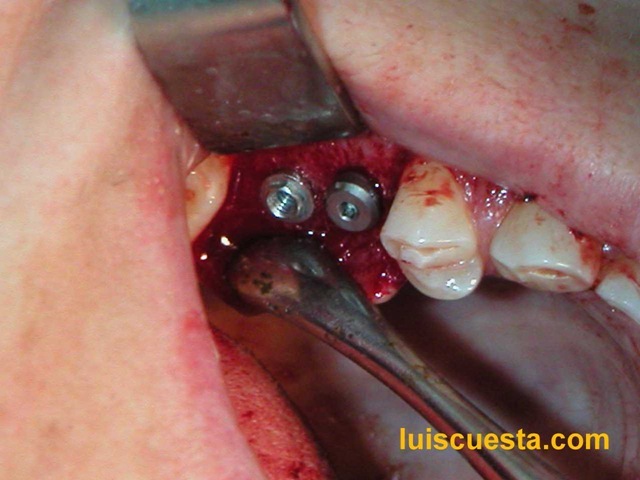 When the occlusion is so well defined, I take partial casts, as they are more comfortable to obtain. I placed an overnight acrylic splint to prevent bruxism, too.